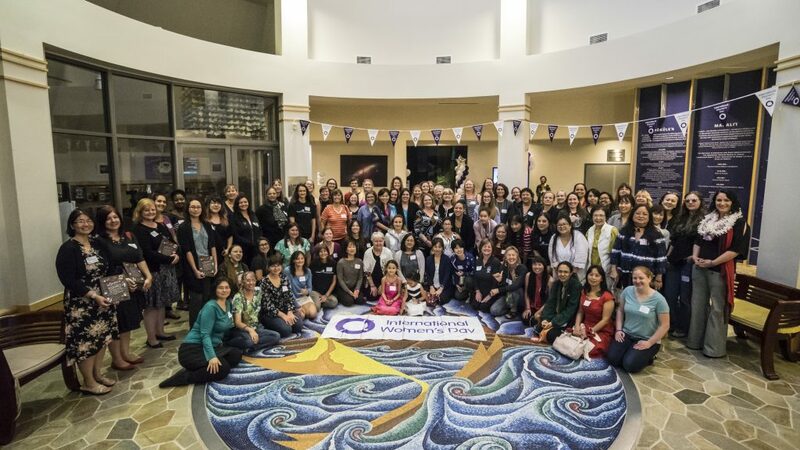 The Women of Maunakea once again met to celebrate their achievements and seek more advancements at this years International Women’s Day event held on March 3rd at Imiloa Astronomy Centre, Hilo, Hawai`i. Jessica seeks to get to gender parity within the ranks of the organization by 2024 . 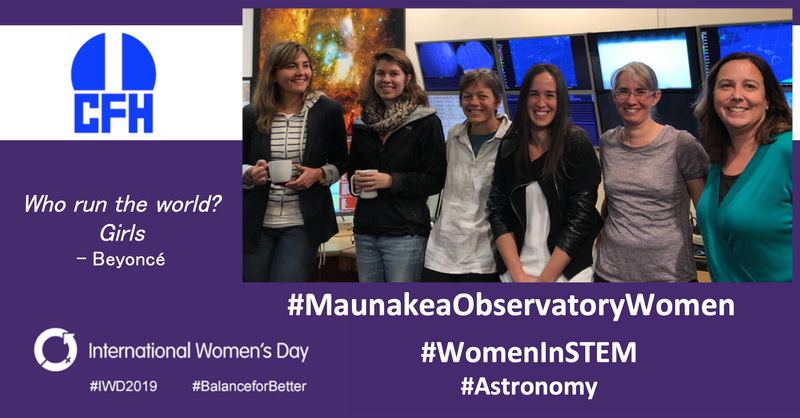 The event has been followed with a number of social media posts by the Maunakea Observatories within Hawai`i in support of International Women’s Day 2019 held on March 8th (#IWD2019). 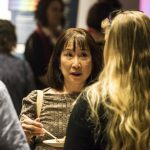 The 19B Call for Proposals closes on the 15th of March, 2019. If this is your first time using Hedwig, you should ‘Log in’ and generate an account. There is a Hedwig ‘Help’ facility at the upper right corner of each page, and individual Help tags in many other places. 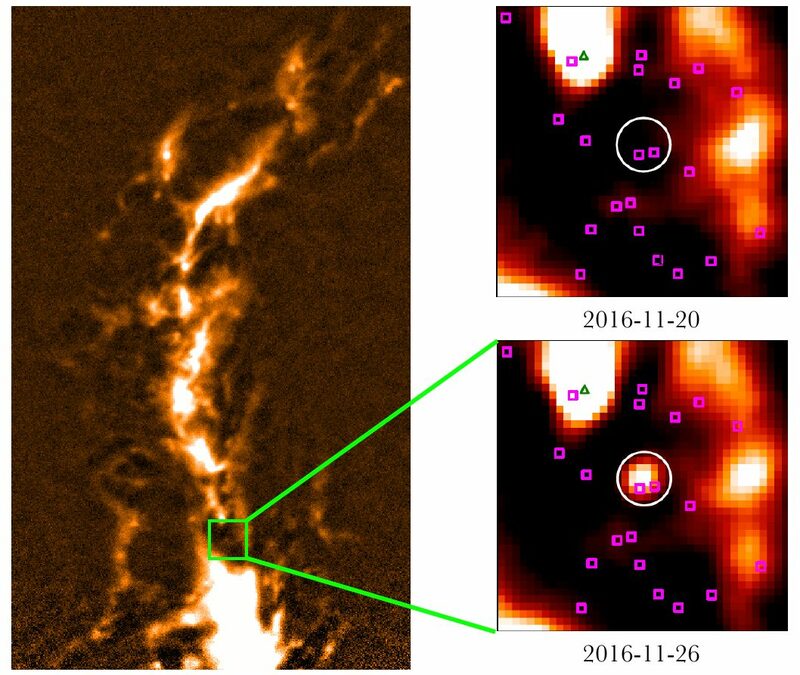 On November 26th, 2016, the JCMT Transient Survey Team observed what is estimated to be the most luminous known flare associated with a young stellar object. It is also the first coronal flare discovered at submillimetre wavelengths. The brief flash of light occurred in the direction of a binary system of forming stars known as “JW 566” in the Orion Nebula and it carried ten billion times the amount of energy of the solar flares observed around the Sun. The flare was discovered by JCMT support astronomer Dr. Steve Mairs using advanced image analysis techniques that had been developed by the Transient Survey team over the past 2 years. The SCUBA-2 observations lasted approximately 30 minutes over which time the flare faded to half of the brightness measured at the beginning of the scan, indicating the event was short-lived. The flare is thought to be caused by an intense magnetic field re-connection event that energised charged particles to emit gyrosynchrotron/synchrotron radiation. 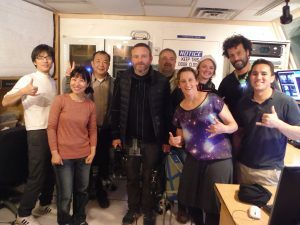 The JCMT Transient Survey team is an international collaboration of 80 astronomers led by Dr. Gregory Herczeg of Peking (Kavli Institute for Astronomy and Astrophysics) and Dr. Doug Johnstone (National Research Council of Canada). The team has been monitoring 8 star-forming regions in the Milky Way with a monthly cadence since December, 2015. The survey will continue through January, 2020. Observations obtained by the JCMT helped uncover the Brightest Quasar in the Early Universe! The light from Quasar J043947.08+163415.7 is gravitationally lensed by a dim Galaxy in the foreground, allowing Fan et al. (2019, APJL: 870, 11) to get a good look at this active galactic nucleus at a redshift of z = 6.51 (A distance of ~12.8 Billion Light years!). As the authors note, “This is the first such object detected at the epoch of reionization, and the brightest quasar yet known at z > 5”. 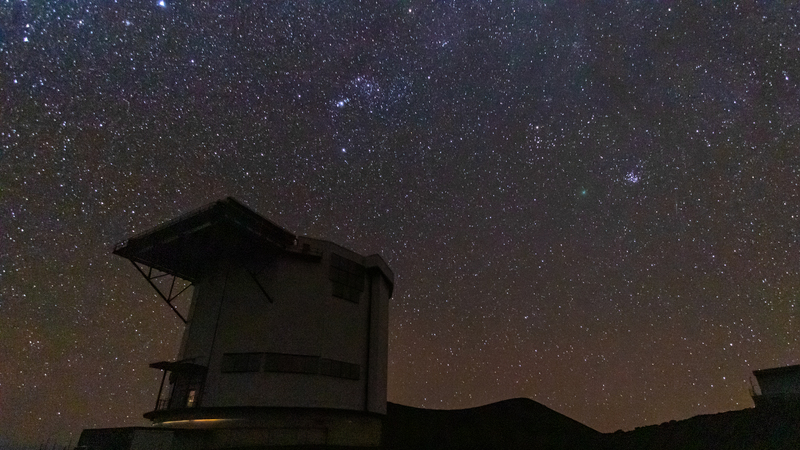 The JCMT is instrumental in observing distant star-forming galaxies. These galaxies have high concentrations of dust that reprocess the starlight such that it is emitted at infrared wavelengths. The light is then redshifted due to the expansion of the universe into the submillimetre regime. The star formation rate is estimated to be 10,000 times higher than that of our own Galaxy, the Milky Way. 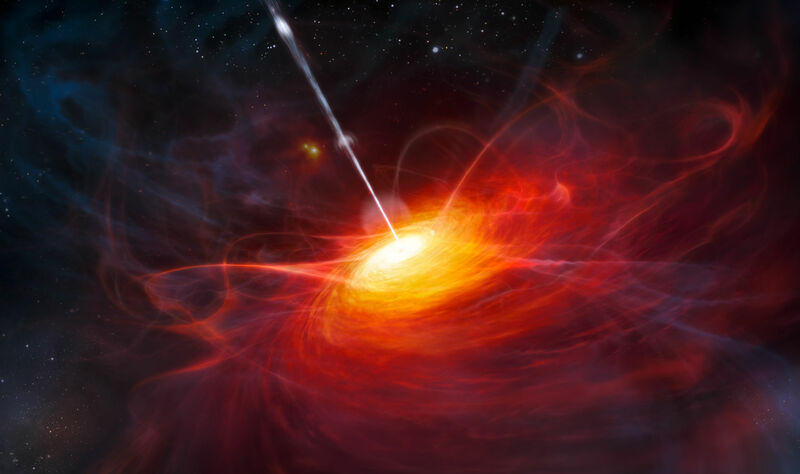 The name “Quasar” is a shortened version of the original designation scientists gave to a mysterious signal we didn’t have a scientific interpretation for: a “quasi-stellar radio source” discovered in 1963 by Maarten Schmidt. Over decades of intensive studies, astronomers have been able to determine that these mysterious signals were coming from intense bursts of light in the hearts of galaxies far, far away. Most (maybe all!) galaxies contain a supermassive black hole millions to billions times the mass of our Sun. In some of these galaxies, infalling material gets too close to the black hole and it heats up to millions of degrees, exploding outward in a massive release of energy! We can detect those signals, which we now affectionately call Quasars, at submillimetre wavelengths with the JCMT. Congratulations to Dr. Xiaohui Fan and his co-authors ! Happy Holidays from the staff at EAO. 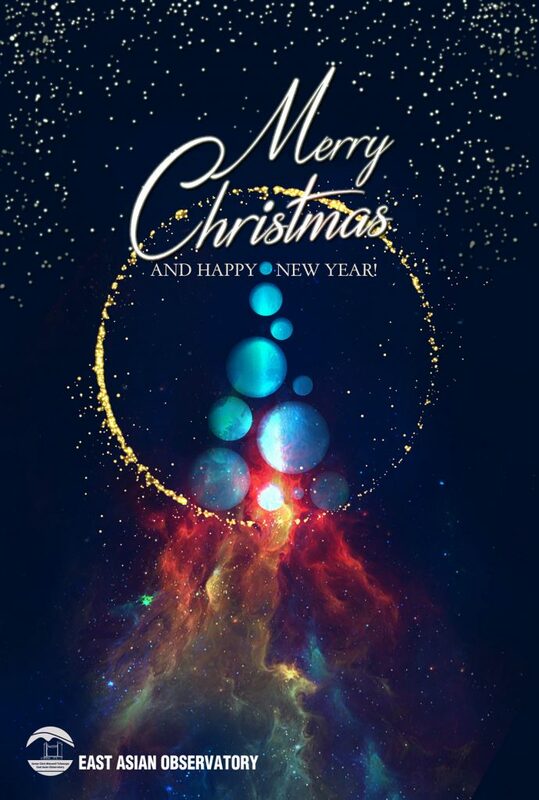 We wish all our astronomy family and friends dry skies, good data and fantastic results in 2019 – image credit: Jung Shan Chan, EAO resident artist. 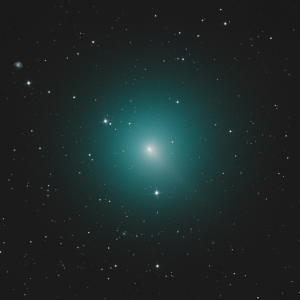 Comet 46P/Wirtanen is known as a hyperactive comet. Hyperactive comets are a small family of comets whose activity levels are higher than expected. In addition to being hyperactive 46P/Wirtanen will make the 10th closest ever cometary approach to Earth of modern times (0.08au) this month. JCMT astronomers will take this opportunity to map the distribution of chemicals like hydrogen cyanide and methanol in this comet’s coma, to try and determine if these chemicals emerged directly from the comet nucleus or were formed in the coma from other chemicals. This mapping will be performed by the JCMT spectral line instrument; HARP. In addition to observing these chemicals the astronomers are hoping the comet will be bright enough to make other measurements that that will shed light on the original location and conditions of the comet’s formation within the very early stages of what we now know to be our Solar System. Comet 46P/Wirtanen from the NASA Astronomy Picture of the Day 2018 November 15, Image Credit & Copyright: Alex Cherney (Terrastro, TWAN). 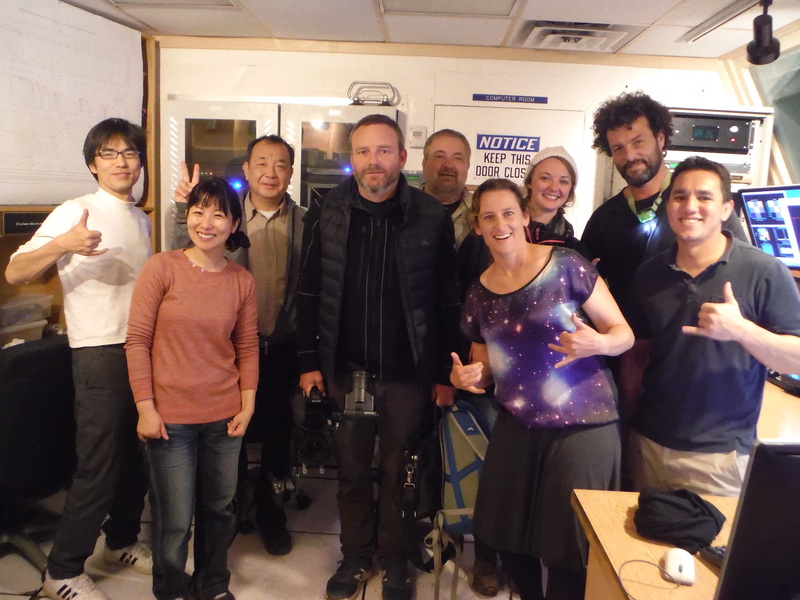 This past week the JCMT was host to a film crew from the Australian Broadcasting Corporation, based in Sydney. 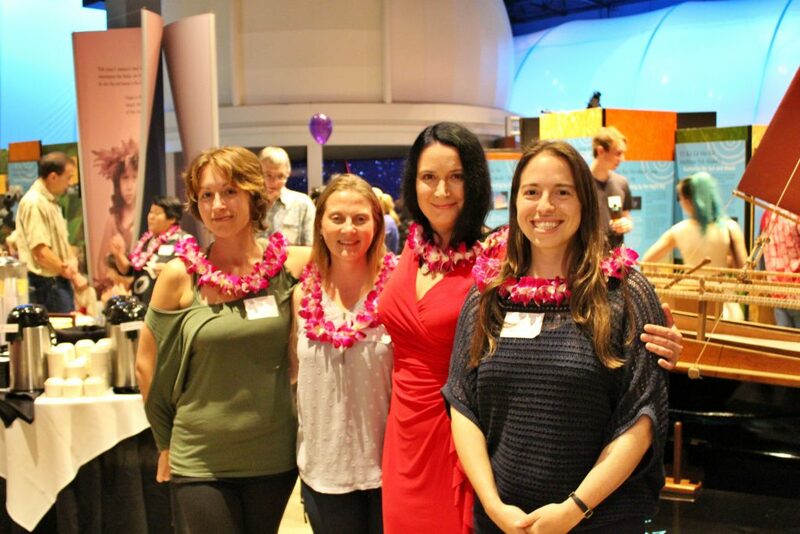 The crew were visiting Hawaii as part of a science television program called Catalyst. 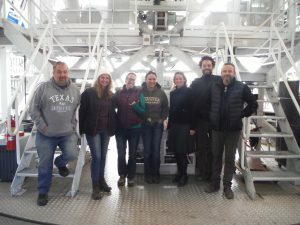 Specifically they were out visiting the JCMT as part of a program about the Black Hole at the centre of our Milky Way, and how JCMT, along telescopes from around the world are coming together to form the Event Horizon Telescope – looking to take an image of the shadow around the Black Hole at the centre of our Galaxy. The EAO Outreach Team was thrilled to be invited to help out at the 2018 STEM Fest event held in Waimea at the Kahilu Town Hall for Big Island Girl Scouts. 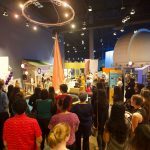 The event, attended by 75 girls on November 17th, provided the opportunity to experience hands on activities from a variety of science and engineering fields. 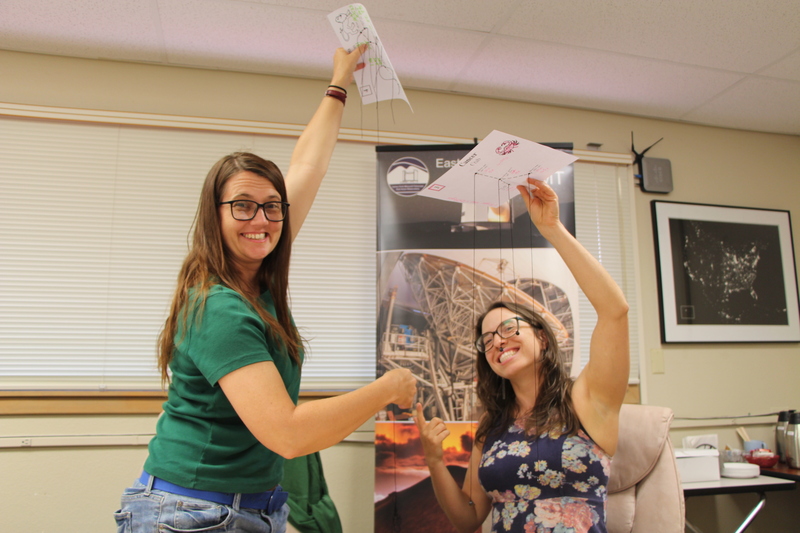 JCMT staff members Alexis Achohido and Mimi Fuchs worked with Girl Scouts to discover how astronomers know what stars are made of. In particular we highlighted the work of Cecilia Payne-Gaposchkin, who proposed a theory for the composition of stars in her 1925, her PhD Thesis! As well as looking at what stars are made of we also looked at what dense interstellar dust clouds are made of and made our very own candy molecules. 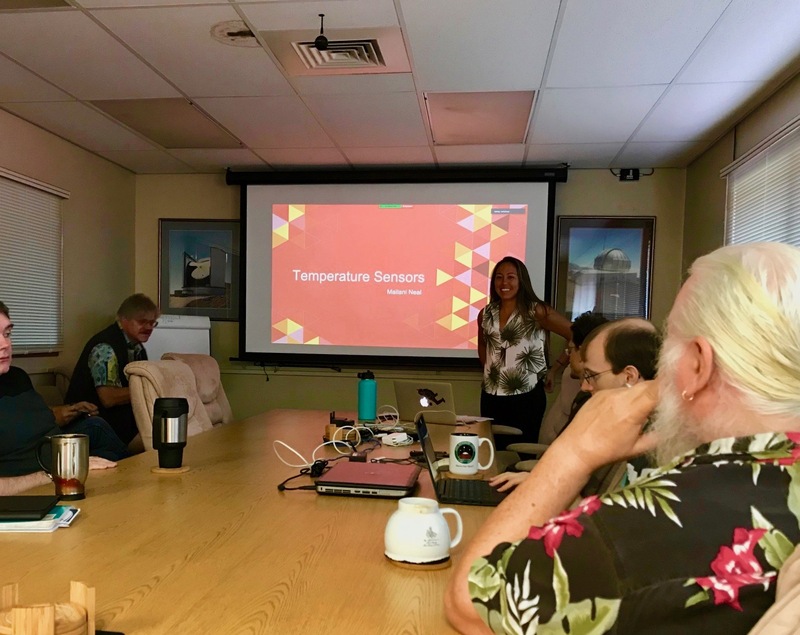 The third Maunakea Wonders Teacher Workshop began on October 17th at the University of Hawai’i’s Department of Education in Hilo. 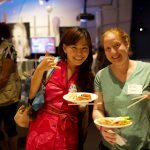 Throughout the second half of October, we have the incredible opportunity to share fun astronomy activities and resources with the future teachers of Hawai’i. 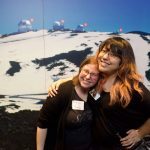 Despite the frigid weather, this included on-site tours of the JCMT and UKIRT where we had a blast talking about the different functions of each telescope on the mountain. 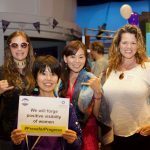 We are looking forward to more fun and excitement on campus on October 31st – Mahalo nui loa to this vibrant group of educators! 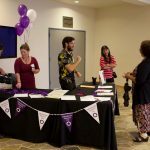 In July 2018, the Maunakea Gender Equity and Diversity Committee distributed a survey to the staff at the Maunakea astronomical organizations. 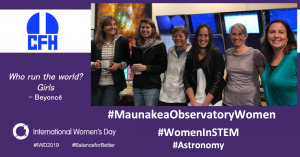 The survey was intended to invite opinion on the current state of equity and diversity in the Maunakea astronomy community and seed conversation and ideas for enhancing diversity and inclusion in our organizations across our islands. 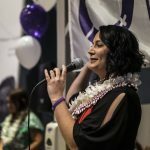 The first results are presented by Jessica Dempsey at the Maunakea Users’ Meeting on October 4th, 2018. 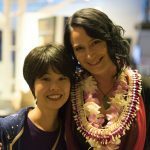 A PDF of the talk is linked here for convenience. For usage or distribution of these data, please contact Jessica Dempsey: j.dempsey “at” eaobservatory.org. 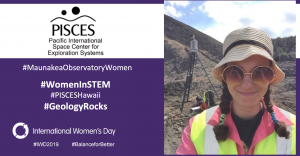 The East Asian Observatory wishes to extend a big mahalo to our summer intern Mailani Neal for her excellent work tracking temperature changes across the JCMT’s dish! 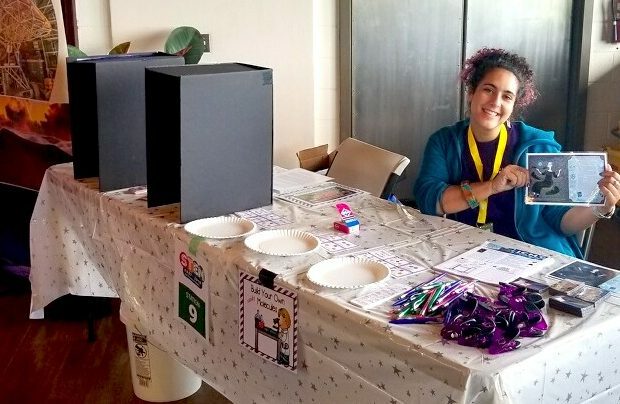 We are grateful for all her hard work and we wish her all the best as she enters her final year at Rensselaer Polytechnic Institute in New York! This analysis is important for understanding calibration observations and the effect of the weather on all the data we collect. POL-2 is the JCMT’s sub-millimeter polarimeter working at both 450 and 850 microns. POL-2 is a polarimeter not a detector, and so requires SCUBA-2 for use. It is used to trace the alignment of dust particles at sub-millimeter wavelengths and thus the magnetic field orientation and strength (with some additional physics added into the mix) of regions in our Universe! Recently it has been found that sometime there is a loss of synchronisation between data values and pointing information in the data reduction process (CALCQU, run by pol2map as part of step 1). This loss of synchronisation is triggered by anomalous values in the array of HWP (Half Wave Plate) angles stored in the raw data. The result is blurring (or smoothing) of sources in some POL-2 maps (see figure below). The fix is to download our rsync this build of the starlink software and re-reduce your data. If you look at your re-reduce data you may find that some of your maps improve, depending on whether any of your observations suffered from the blurring problem. The size of the improvement will depend on how many blurred observations you have. For regions where multiple observations were used to produce the final maps the issue may have been less pronounced if obsweight=yes was used. In addition, users wishing to reduce POL-2 450 micron data are asked to ensure the data have been reduced using the latest starlink 2018A software prior to this release there was a bug in the software which caused a 4 degree difference in the angular zero point at 850 and 450, so all 450 vector maps produced so far will have a systematic error of 4 degrees in the vector angle, unless updated software (rsync starlink or 2018A starlink) was used. The image shows two total intensity maps made from an observation of OMC1. Left: before the fix for blurring. Right: after the fix for blurring. Then in gaia, in the pop-up window that holds the cube visualisation controls, drag the “Index of plane” slider left or right to step through the planes in the cube! You can do the same for the Q or U maps by replacing “I” with “Q” or “U” above (note, that’s an upper case “I” for the externally masked I maps – use a lower case “i” for the auto-masked I maps). In May our engineering staff undertook major maintenance work of the Secondary Mirror Unit on the JCMT. After this work it was noted that the Secondary mirror was sometimes vibrating, which lead to beam deformation. This was noticed due to sporadic increased FCF values – and could also be seen in the aspect ratio of our calibrators (see image below). Observers who collected data between UT dates May 24th 2018 and 08:10UT on June 30th 2018 should be aware of this issue. Astronomers who may have affected observations should check their data closely. This issue was noted to be intermittent. 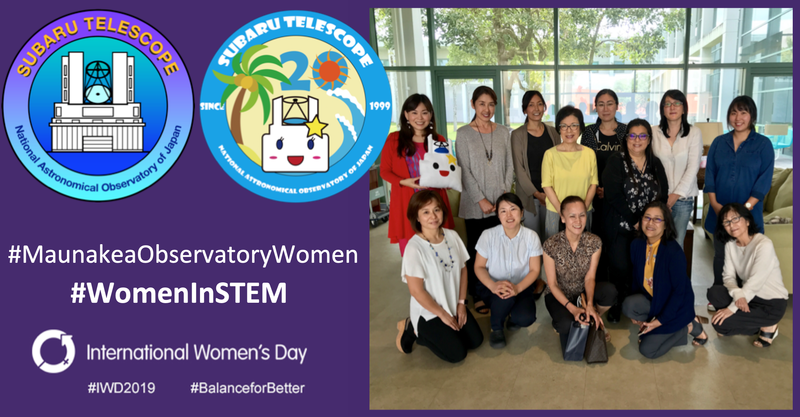 If you have questions about the data quality please contact your Support Scientist or the observatory directly. On June 30th, we applied a temporary work-around to account for these SMU vibrations. To implement a more permanent solution, the observatory briefly removed the GoreTex membrane to work on the Secondary Mirror Unit. This work was performed between Tuesday July 24th, and Monday, July 30th. The PI and Large Program time were unaffected. 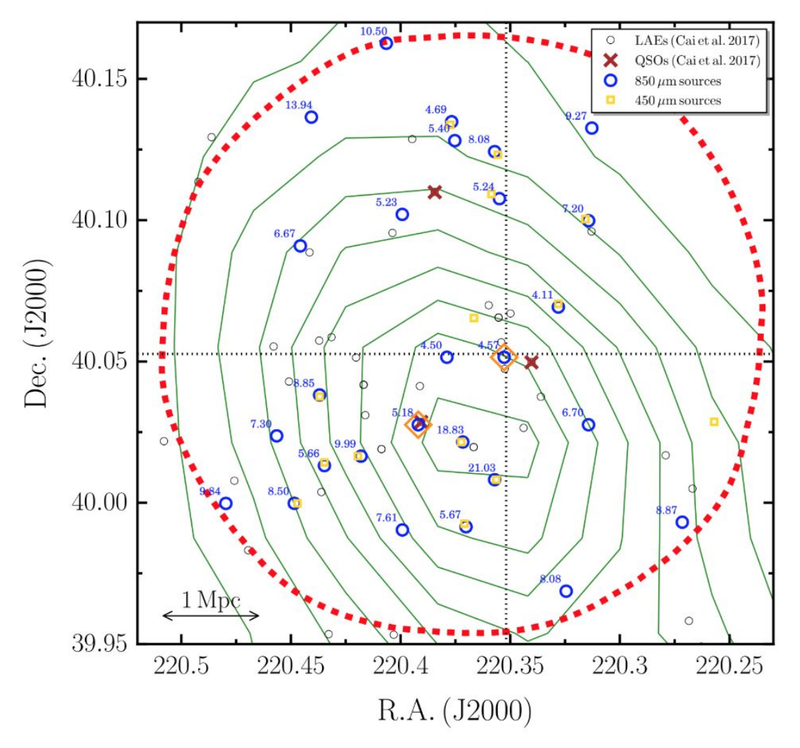 Below is a plot showing the aspect ratios of calibrator CRL 2688 over time. The blue, shaded region represents the nominal values. Note that the high aspect ratios observed in between the temporary and permanent fix (boxed in red) were part of a low elevation, poor weather (wet grade 5), poor seeing engineering and commissioning project. Regular observing was unaffected. 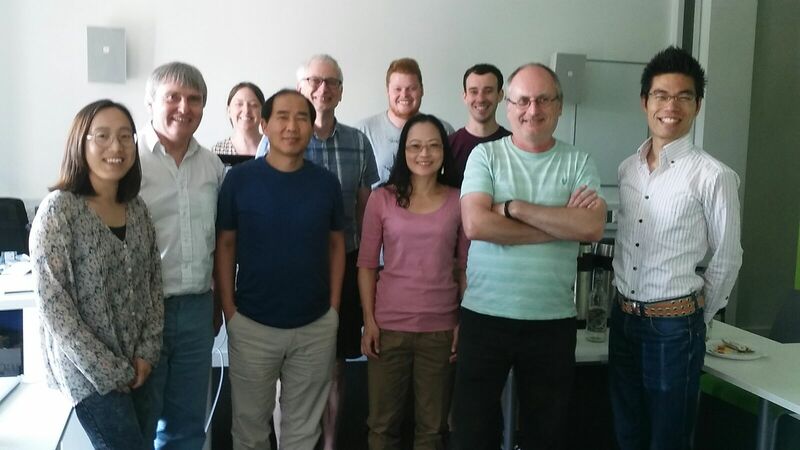 Members of the CHIMPS-2 Large Program met for a two day meeting in Liverpool on June 28th and 29th. 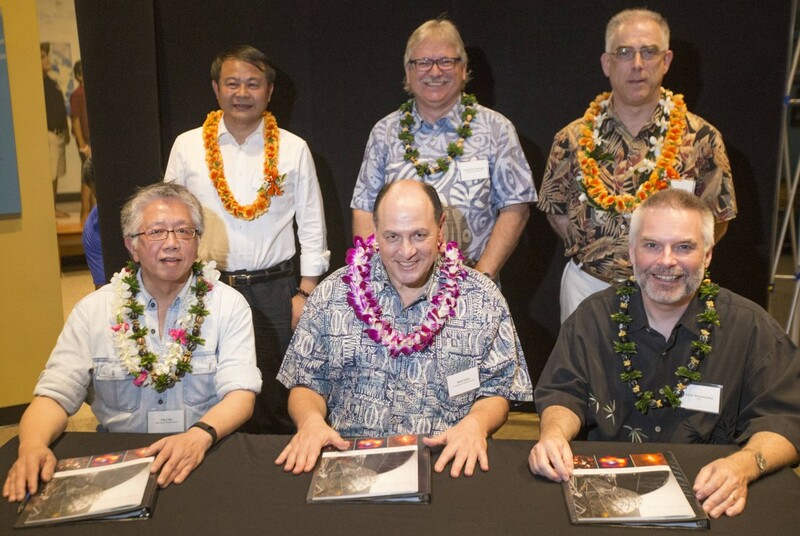 The meeting covered data collection, reduction and analysis with astronomers from all over the globe. For more information on the CHIMPS-2 project click here. 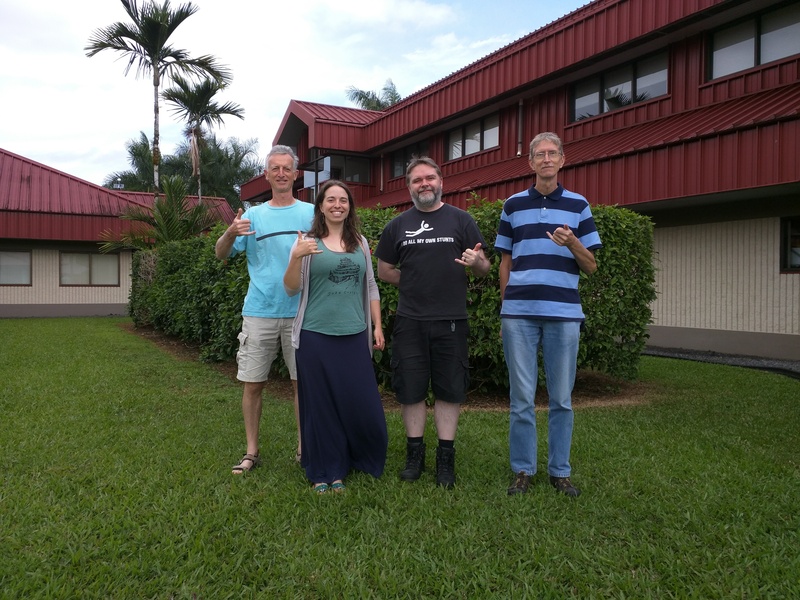 We wish the team “clear skies” as they look to expand the JCMT CO heterodyne data towards the Galactic Centre this summer. We are only as good as the instruments we have. With this sentiment in mind, we make way for the next generation of instruments as we retire one of our long-serving heterodyne receivers, RxA3. RxA3 (http://www.eaobservatory.org/jcmt/instrumentation/heterodyne/rxa/) has been a stable source of great science for the JCMT since it was built by the Herzberg Institute of Astrophysics and delivered in 1998. It has served our JCMT user community well and the data collected from RxA3 will be utilized still for years to come. 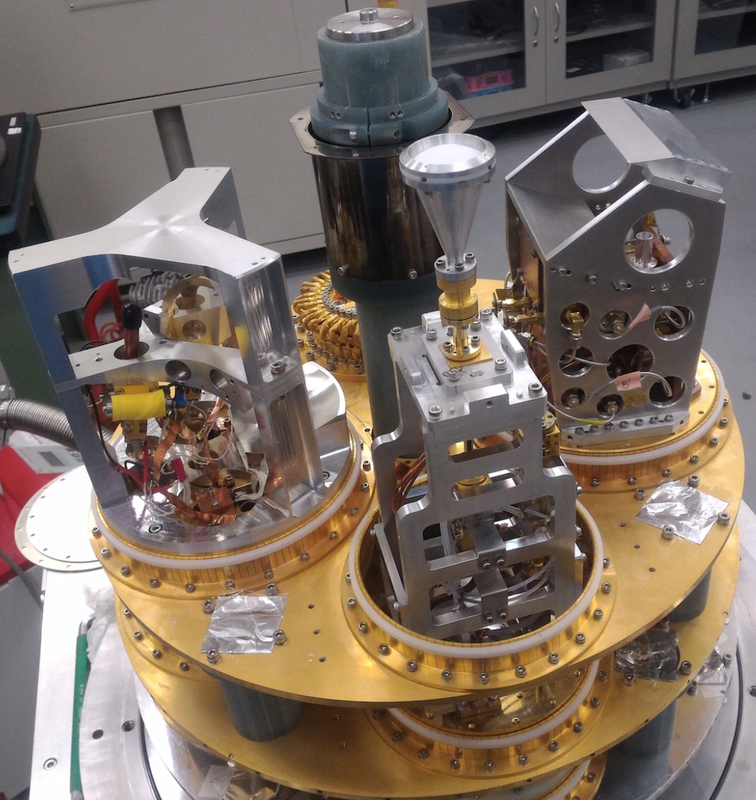 The GLT receiver installed at the JCMT when it was being tested in August 2017. 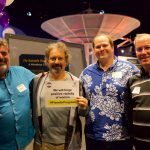 With the retirement of RxA3, JCMT prepares for it’s replacement to arrive in January 2019 and hopes to be on sky by April 2019 in time for the next Event Horizon Telescope observing run. 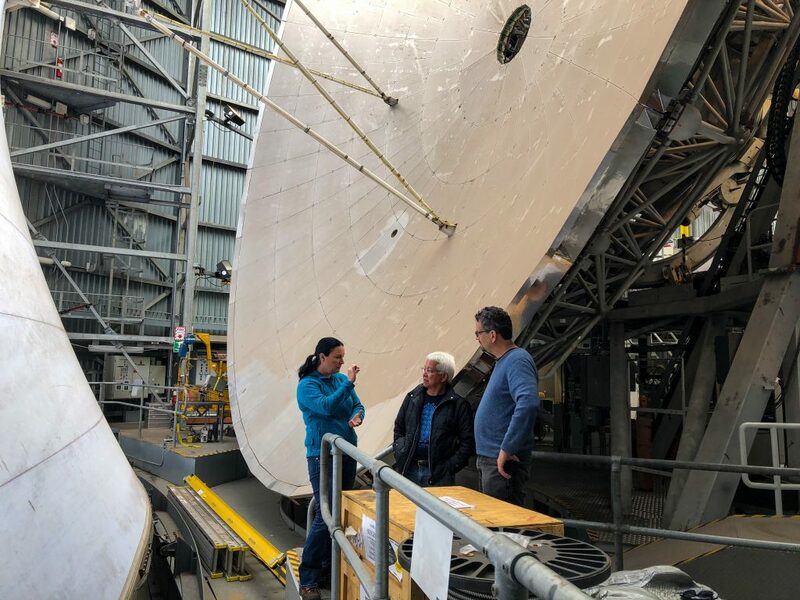 The replacement will be a three-receiver cryostat identical to that installed on the Greenland Telescope (GLT), and is estimated to be able to complete observations in approximately 1/4 of the time required by RxA3. 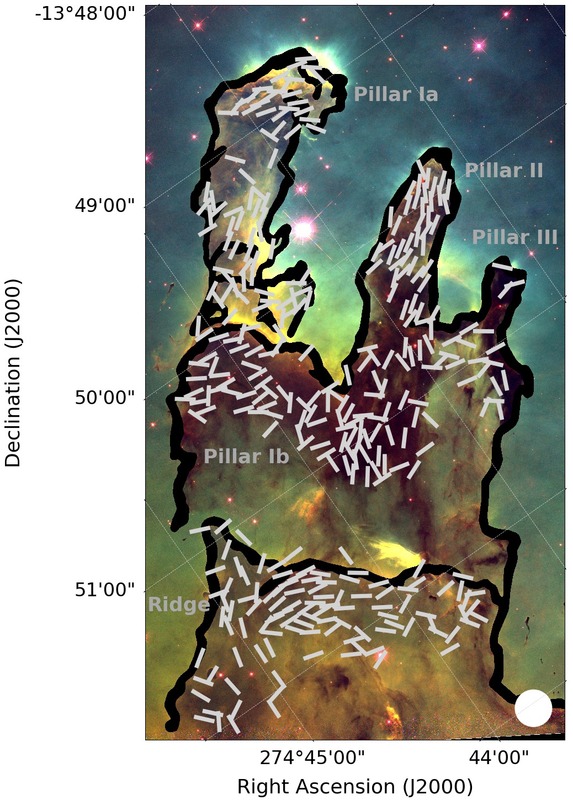 The BISTRO (B-Fields in Star-Forming Region Observations) Survey has for the first time mapped the magnetic field in the dense gas of the ‘Pillars of Creation’, using instruments on the James Clerk Maxwell Telescope (JCMT). The Pillars of Creation, in the Messier 16 star-forming region, which is also known as the Eagle Nebula, were the subject of one of the most iconic images taken by the Hubble Space Telescope (HST). The Pillars are a set of columns of cold, dense gas protruding into a region of hot, ionized plasma. The Pillars have nurseries of new stars forming at their tips, and are a particularly dramatic example of a feature found in many regions of interstellar space in which high-mass stars are forming. 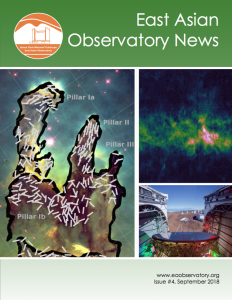 We present the first high-resolution observations of the Pillars in polarized light at submillimeter wave- lengths – submillimeter light being on the cusp between infrared and radio waves, where the cold, dense dust and gas which will form the next generation of stars emits most of its light. Light emitted from these dusty regions is polarized perpendicular to the direction of its local magnetic field, and so we can use our observations to directly probe the magnetic field morphology within the dense gas of the Pillars of Creation. Our observations were taken at a wavelength of 0.85 mm as part of the BISTRO Survey, using the POL-2 polarimeter on the SCUBA-2 submillimeter camera at the JCMT. They show that the magnetic field runs along the length of the pillars, at a significantly different angle to the field in the surrounding ionized plasma, and has an estimated strength of approximately 170 − 320 microGauss (1.7 − 3.2 × 10−8 Tesla), an intermediate magnetic field strength for a region of space which is forming stars. Young hot stars, with masses more than eight times that of the Sun, produce large numbers of high-energy photons. These high-energy photons ionize a volume of the region within which they form, splitting hydrogen atoms into pairs of protons and elections. As the shock front between the material ionized by the young stars and the untouched neutral material advances, complex structures form in the dense gas at the interface. Particularly, pillars of dense, neutral gas like those in M16 are found protruding into the ionized region, apparently left behind by the advancing shock front. The formation and evolution of these pillars is not well-understood – debate continues as to whether these pillars form behind obstructions to the shock front, or whether they can form from turbulent instabilities in the shock front itself. The role of the magnetic field in the formation of the Pillars is particularly uncertain, since the strength of the magnetic field in the dense parts of the Pillars has not been measured until now. BISTRO magnetic field vectors overlaid on a HST 502 nm, 657 nm and 673 nm composite image of Pillar II. The magnetic field runs roughly parallel to the Pillar’s axis. No polarization is detected at the Pillar’s tip – this depolarization is consistent with a horseshoe-shaped magnetic field morphology on scales smaller than the beam. Our observations of the magnetic field running along the length of the Pillars are consistent with the Pillars being formed by compression of gas with an initially weak magnetic field: the magnetic field has not had the strength to resist being dragged into its current configuration by the motions of the gas. However, the magnetic field strength appears to have been increased by being compressed in the forming pillars. The magnetic field strength that we estimate is large enough to magnetically support the sides of Pillars against collapsing radially under pressure from the surrounding hot plasma, and to prevent the Pillars collapsing under their own gravity. It is important to note though that the Pillars are still being destroyed by the same shock interaction that created them: the magnetic field that we measure is not strong enough to prevent the Pillars being gradually eroded from their tips by the effects of the young stars in the region. Our results suggest that the evolution and lifetime of the Pillars may thus be strongly influenced by the strength and orientation of their magnetic field: the Pillars’ longevity results from magnetic support. Our proposed evolutionary scenario: (a) an ionization front moving perpendicular to the am- bient magnetic field approaches an existing over-density in the molecular gas. (b) The ionization front is slowed by the over-density. The flux-frozen magnetic field ‘bows’ into the forming pillar. (c) The com- pressed magnetic field supports the pillar against further gas-pressure- and gravity-driven radial collapse, but cannot support against longitudinal erosion of the over-density by ionizing photons. Throughout, dark blue shading represents molecular gas and light blue shading represents ionized material. The ionization front is shown as a black line. Grey dashed lines indicate the local magnetic field direction. Red arrows represent photon flux, black arrows represent magnetic pressure, and green arrows represent thermal gas pressure. 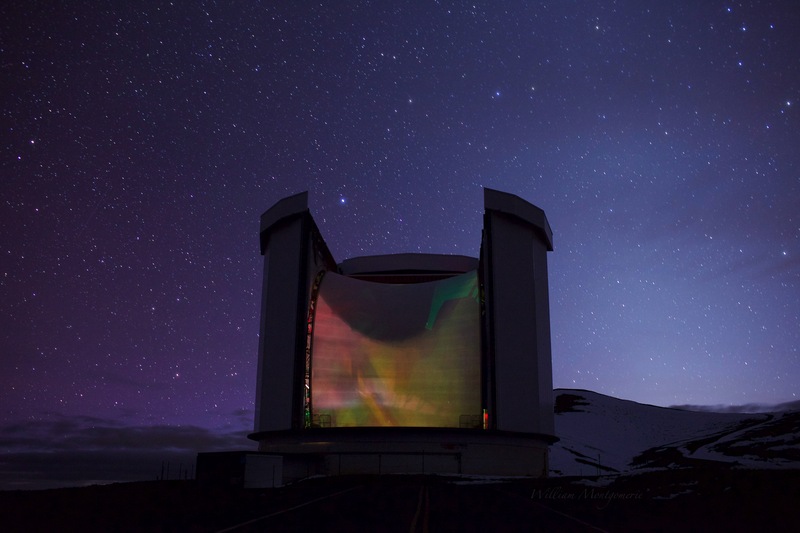 The James Clerk Maxwell Telescope, located on Mauna Kea in Hawaii, is operated by the East Asian Observatory. 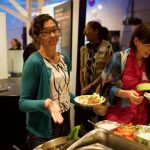 The BISTRO Survey is a large team of scientists working to understand the role of mag- netic fields in the formation of stars, with members from across the partner regions of the East Asian Observatory: China, Japan, South Korea, Taiwan and Vietnam, and from participating universities in the United Kingdom and Canada. This research has been accepted for publication by The Astrophysical Journal Letters. A pre-print is available at http://arxiv.org/abs/1805.11554. The “Pillars of Creation” is one of the most well-known images in astronomy, and it is very exciting to be able to add to what is known about this part of the sky. The pillars are beautiful structures – remarkable for their highly coherent structure within the dynamic and highly energetic environment of a region forming high-mass stars. We have found that the magnetic field within the Pillars is well-ordered, running along the length of the pillars, and is strong enough to influence the future evolution of the pillars, helping to support them against collapse. This is an intriguing result because it shows us that the magnetic field is important to the region now, but also that it was likely not very important during the period when the pillars were forming. The field appears to have changed significantly from its original direction to run along the pillars as they were formed by a shock interaction caused by nearby young stars. This could not have happened if the magnetic field were strong enough to resist being moved. Our results suggest that the importance of the magnetic field to the Pillars of Creation has evolved over time along with the Pillars themselves. 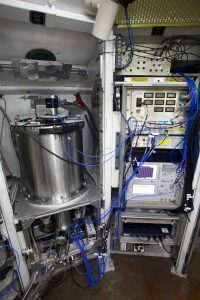 The JCMT is the only telescope in the world which could have made these observations – the JCMT’s POL-2 polarimeter and SCUBA-2 camera are a unique combination of instruments, observing at the wavelengths at which cold dust in star-forming regions emits most of its light. 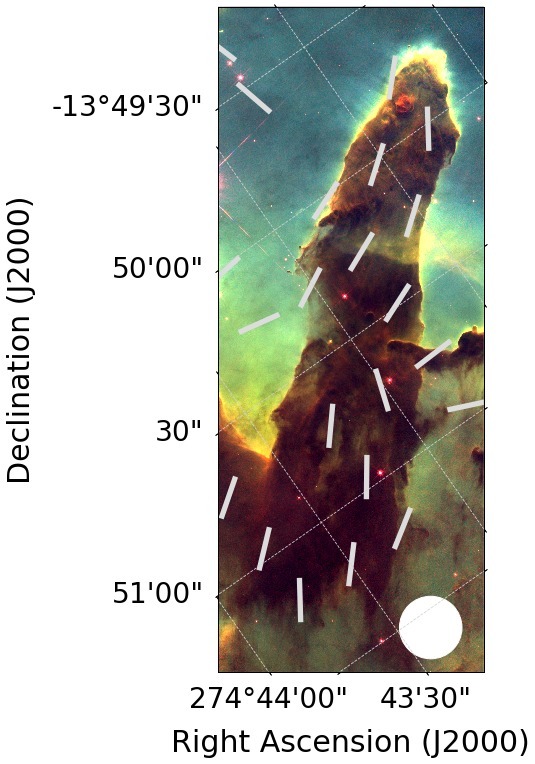 POL-2 provides information on the magnetic field on the scale of objects such as the Pillars of Creation which is not available anywhere else. We have already had a proposal accepted by the Submillimeter Array (SMA) on Mauna Kea to observe the magnetic field in the tips of the pillars in more detail. In our JCMT observations we see the magnetic field disappear at the tips of the pillars. This “depolarization” could be caused by tangled magnetic field lines or a complete reversal of magnetic field direction in the pillars’ tips causing the field to cancel out in our observations. By observing at higher resolution with the SMA we will be able to see what the magnetic field looks like on these small scales, and to better understand what role the magnetic field is playing in the shock interaction which is driving the pillars’ evolution. We could also potentially look in more detail still at the magnetic field in clumps in the pillars’ tips using the Atacama Millimeter/submillimeter Array (ALMA) in Chile, or observe the pillars in polarized near-infrared light using the airborne SOFIA observatory. We are always striving to do better at the JCMT and that means we often update our software. One software update that uses should be aware of is a new version of the JCMT Observing Tool. It is particularly important to note that the OT version used for all semester 18B MSB preparation must be 20180516 (or newer). This may be checked via the OT start-up splash screen and also via the “Help -> About” menu option. 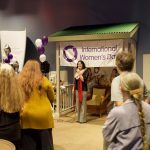 March 8th, 2018 was International Women’s Day. The EAO celebrated by hosting a special event at the ‘Imiloa Astronomy Center that gathered together all of the women who contribute to the Maunakea organizations. 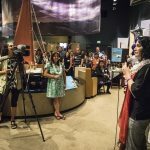 We strongly believe that the future of Maunakea lies in the hands of the young people of these islands. 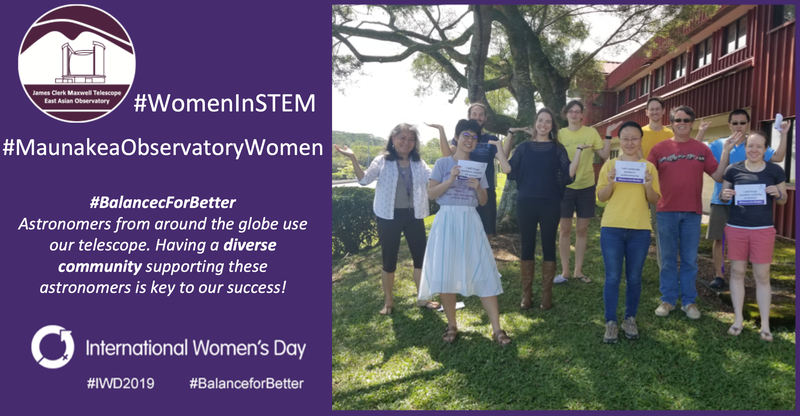 The bright and talented young women of our community are enabled and empowered by seeing women in successful roles at all levels of scientific, political and business enterprise. 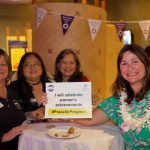 This event provided one more step, in what we hope will be many, towards gender equity in the Maunakea organizations and beyond. We are thrilled with the amount of support we received following the event. See below for links to articles and news features. The 18B Call for Proposals closes on the 15th of March, 2018. The JCMT 2018 User Meeting held in Seoul, South Korea was a success last week, with 39 science talks spread over two days. The pdf’s of the talks and posters can be found at the following link: User Meeting Program. Participants outside the conference center in Soul. January 10, 2018 The JCMT’s protective membrane is back in place after our month of commissioning without it. Now we can go back to observing in reasonable wind and during the daytime! From time to time the JCMT is closed due to major maintenance work. The next scheduled closure of the JCMT will occur from April 30th 2018 to mid May 2018. During this time the Gore-Tex membrane windblind will be removed to provide access to the Secondary Mirror Unit for maintenance work. As the telescope will be unavailable for science during this time the SCUBA-2 Gas Handling System will also be worked on. SCUBA-2 will be warm during this period and should back to operational temperature/available for science use by the end of May. The staff at EAO would like to announce that we are planning an approximately month-long observing campaign without our iconic Gore-Tex membrane windblind. The removal of the membrane is due to the high demand for sub-mm polarimetry. Currently the instrument POL-2 is commissioned and working beautifully at 0.85mm, with some fantastic science results. POL-2 science at 0.85 mm has been so successful that we are keen to see if operating without the membrane – which can limit the throughput and increase instrumental polarization – we can commission POL-2 at 0.45 mm. Observing without the membrane is not our normal mode of operation and the telescope will have additional operational limitations during this time. The JCMT will not take daytime observations and the operational wind limits will be reduced. 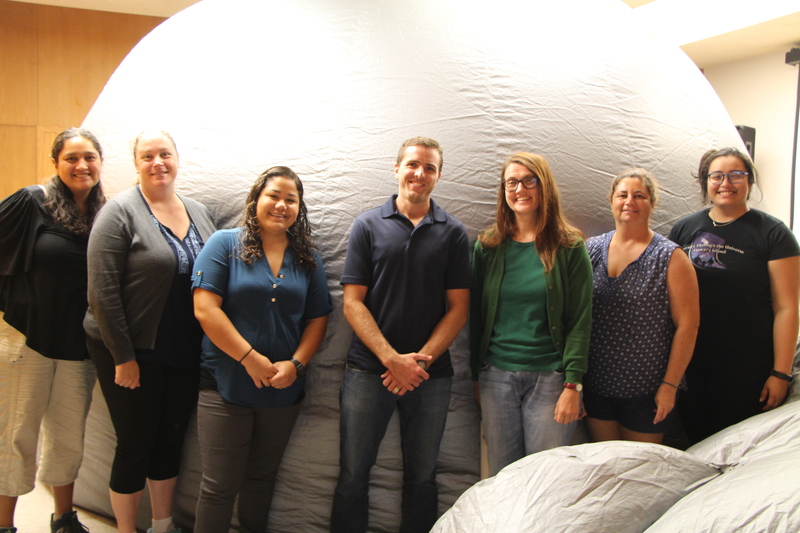 We expect to remove the membrane early in December and thank the JCMT astronomical community for their support. The migration of our OMP database system is now complete. 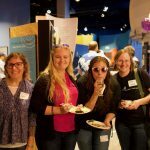 Principal Investigators/Co-Investigators on current JCMT programs (17B PI programs, Urgent queue programs, and the Large Programs) should again be able to retrieve recently-acquired data for their program from either the program’s OMP page or directly from the JCMT data archive at the CADC. As usual, the former method requires that the user’s OMP and CADC accounts are first linked (please see here for more details). Any PIs/Co-Is that continue to encounter problems should consult their designated Friend of Project (FoP). We are currently migrating our OMP database system, a process that is expected to take up to 4 weeks. During this period, any Principal Investigators/Co-Investigators on current JCMT programs (17B PI, Urgent queue projects, and the Large Programs) wishing to retrieve recently-acquired data for their projects should download it directly from the JCMT data archive at the CADC, rather than from the project’s OMP pages. Update: This database migration process has now been completed (see above for further details). comparable to viewing videos instead of photos. November 1, 2017 — An international team of researchers have found an infrequent variation in the brightness of a forming star. This 18-month recurring twinkle is not only an unexpected phenomenon for scientists, but its repeated behavior suggests the presence of a hidden planet. This discovery is an early win for the James Clerk Maxwell Telescope (JCMT) Transient Survey, just one-and-a-half years into its three-year mandate to monitor eight galactic stellar nurseries for variations in the brightness of forming stars. This novel study is critical to understanding how stars and planets are assembled. 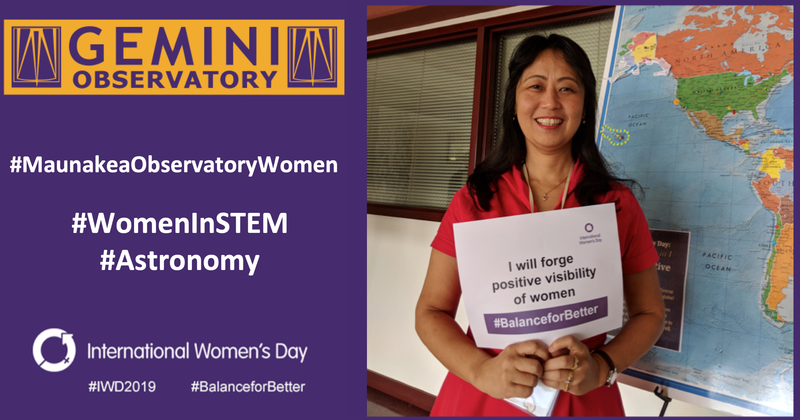 The survey is led by Doug Johnstone, Research Officer at the National Research Council of Canada and Greg Herczeg, Professor at Peking University (China), and is supported by an international team of astronomers from Canada, China, Korea, Japan, Taiwan and the United Kingdom. “This variation in the brightness or twinkle of the star EC53 suggests that something large is disrupting the gravitational pull of the forming star. The fact that it recurs every 18 months suggests that this influence is orbiting around the star – it’s quite likely a hidden, forming planet,” says Doug Johnstone. It is thought that a companion planet is orbiting the star, and its passing gravitational pull disrupts the rate of the gas falling onto the forming star, providing a variation in the observed brightness, or light curve, of the star. Young stars are born in regions of the galaxy where molecular gas is abundant. When the star is young, gas and dust form a thick cloud that surrounds the star. Some of this material quickly flattens into a disk, in which planets will form. The cloud blocks the star itself from optical view, so astronomers study the star indirectly by using the cloud to learn details about the star growing inside. The star builds up its mass as gravity attracts gas to move from the disk onto the star, a process that also releases significant energy that heats up the surrounding gas cloud. Astronomers use telescopes sensitive to sub-millimetre wavelengths, like the JCMT, to measure the cloud brightness and reveal details about the growth of the star. EC53’s light curve anomaly was discovered by Hyunju Yoo, graduate student at Chungnam National University and advisor Jeong-Eun Lee, Professor at Kyung Hee University (South Korea), through careful analysis of monthly observations of Serpens Main, a stellar nursery known to contain many forming stars. Although the brightness of EC53 has been observed to vary periodically at near-infrared wavelengths for some time, these sub-millimetre observations were essential in validating that the brightness variation was due to heating from gas accreting onto the forming star, rather than variations in the cloudiness of the environment. For the remainder of the three-year sub-millimetre survey, the team will continue to monitor EC53 and will also be searching for additional young stars showing variations in growth to learn more about how stars and planets assemble. There are already a half-dozen additional candidate variables within the survey. By studying these stars, and using additional telescope facilities such as the powerful Atacama Large Millimeter/submillimeter Array (ALMA) in Chile, the study will provide new and unique insight into the timescale for the formation of stars and planets, including whether planets form during or after the assembly of the star. Monitoring the brightness of forming stars over time using sub-millimetre wavelengths is an unconventional approach to observing that has been made possible by recent advances in imaging technology, like SCUBA-2, and data reduction processing which enables precise calibration and measurement. The JCMT resides at the summit of Maunakea in Hawaii and is the largest single-dish sub- millimetre telescope in the world. The JCMT is operated by the East Asian Observatory, a partnership between China, Taiwan, South Korea and Japan, with support from the astronomy communities in Canada and the United Kingdom. The university-led contributions from Canada are supplemented by the NRC’s support for the JCMT archive at the Canadian Astronomy Data Centre. This discovery has been accepted for publication in Astrophysical Journal and is available online. This story is distributed on behalf of: The National Research Council of Canada, Peking University and Kyung Hee University. The 18A Call for Proposals closes on the 15th of September, 2017. 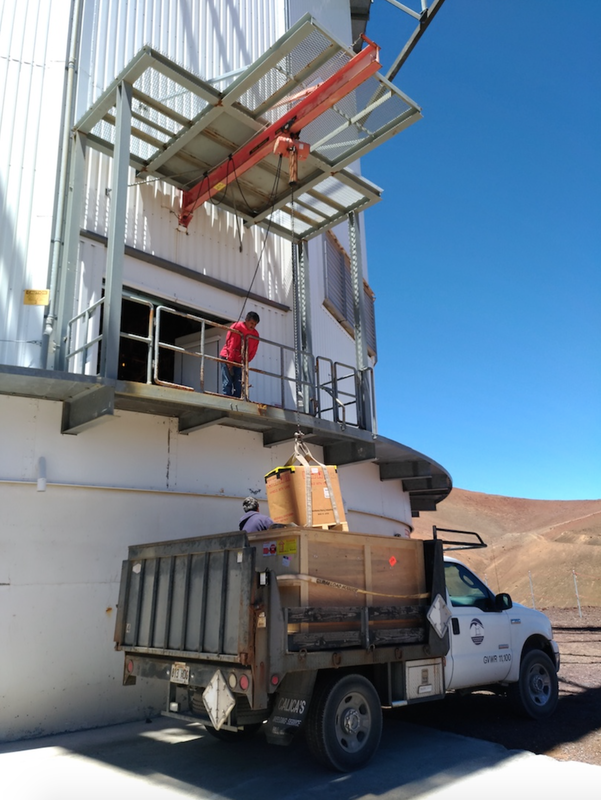 The Greenland Telescope (GLT) is a novel project; taking a 12-meter radio antenna – prototype for the Atacama Large Millimeter/Submillimeter Array (ALMA) project from Chile, and relocating this telescope to Greenland. By repurposing this telescope astronomers can take advantage of the near-ideal conditions of the Arctic to study the Universe at specific radio frequencies. 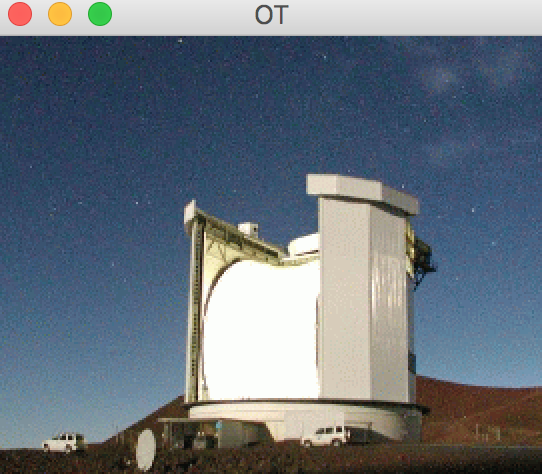 Whilst the telescope is being commissioned the initial receiver that will be used at the GLT is being tested at the JCMT in Hawaii. 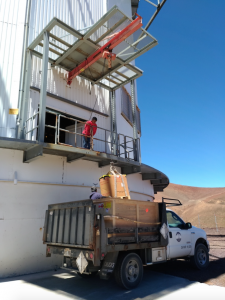 Last week the alignment of the instrument was performed this morning using the Sun as a source – and at the JCMT the first astronomical source for this instrument! form more information visit: www.asiaa.sinica.edu.tw/project/vlbi.php and www.cfa.harvard.edu/greenland12m. 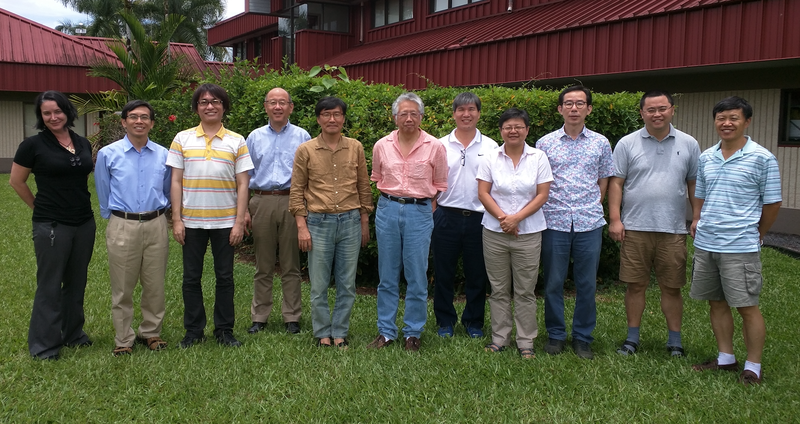 The EAO Mid Term Review committee are meeting this week in Hilo to discuss the future of the JCMT. When the East Asian Observatory took over operation of the JCMT back in 2015 it was for an initial 5 years. Since that time we have had 5 semesters of great science. We have successfully completed three large programs (S2COSMOS, SCOPE, MALATANG). We have uncovered new star-forming events in the sub-mm. We have discovered stellar mass black holes. Our EAO regions have gained access to both Subaru and SMA. Recently we welcomed Vietnam as an observing partner in the JCMT. 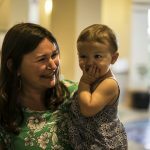 So much to celebrate! EACOA Fellow Dr Tie Liu is the first EACOA Fellow to come to work at the EAO office in Hilo, Hawaii from KASI. 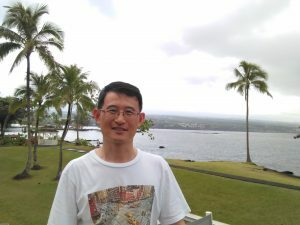 Tie Liu’s main research interest is high-mass star formation and molecular clouds. Tie is the head of a large consortium undertaking the SCOPE, SCUBA-2 Continuum Observations of Pre-protostellar Evolution, program studying Planck cold clumps at JCMT. This program is now (as of July 2017) complete after 300 hours of SCUBA-2 time over the past year and a half. Tie is now turning the focus of this study to follow-up observations with JCMT (e.g. POL-2) as well as many other telescopes (e.g., ALMA, SMA, NRO 45-m, KVN, FAST 500m …). 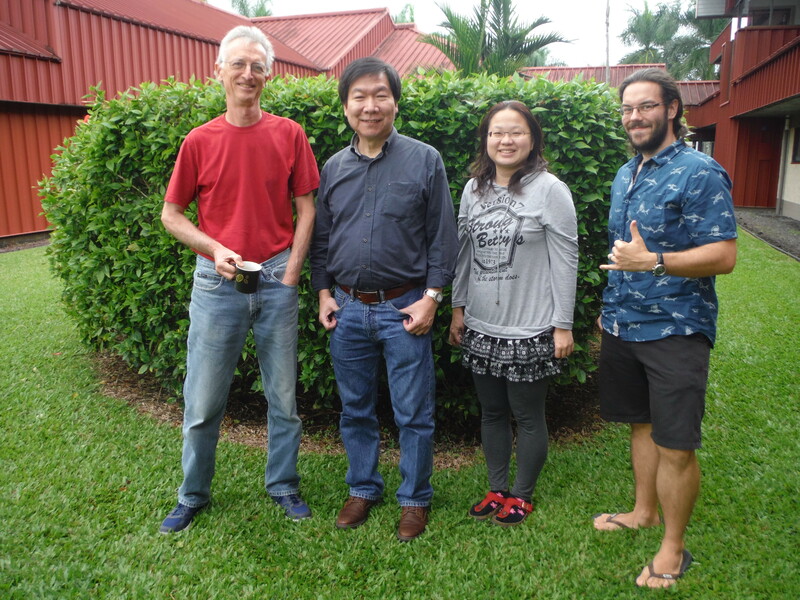 The Staff at EAO are pleased to welcome Tie Liu into the scientific division and hope many more astronomers decide to visit JCMT in the future as long term visitors, to engage directly with JCMT staff. A research team led by Japanese astronomers using data taken with the James Clerk Maxwell Telescope (JCMT), have conducted detailed radio spectral observations of molecular gas around the nucleus of our Milky Way Galaxy, Sgr A*. As a result, the team has discovered two compact molecular clouds that have extremely broad velocity widths at distances of approximately 20 light years from Sgr A*. Despite the fact that these peculiar clouds have large kinetic energies, no energy source has been found there. Thus, the team interprets that each of the clouds is driven by the high-velocity plunge of an isolated (invisible) black hole without a companion star into a giant molecular cloud. This implies that multiple “stray black holes” are floating around a supermassive black hole lurking at the Galactic center. 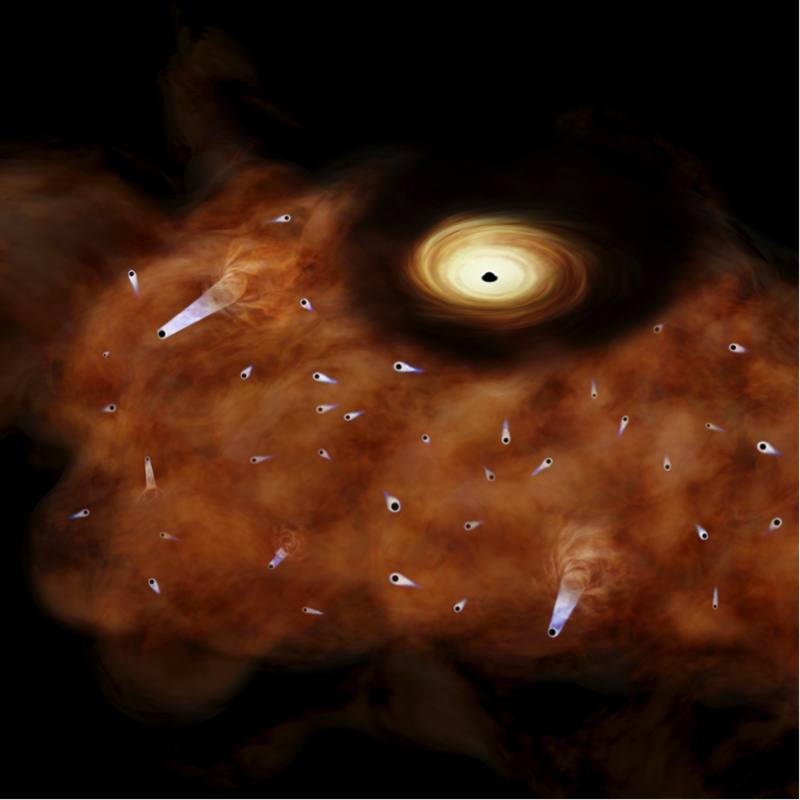 Illustration of stray black holes floating around a supermassive black hole at the Galactic center. The team studied two unusual molecular clouds. These two clouds were discovered in the vicinity of the Galactic nucleus of the Milky Way, Sgr A*. Their motions and physical properties were studied and their motions were deemed to be abnormal. The origin of each of unusual clouds cannot be explained by an interaction with a supernova. 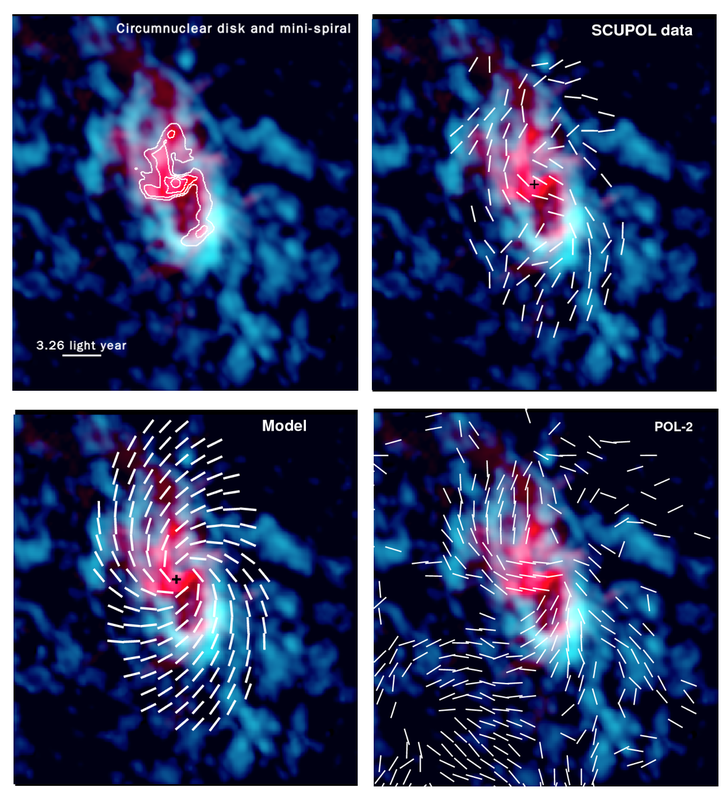 The clouds are also not explained by a bipolar outflow from a protostar. This implies that the origin is likely to be an obscure astrophysical phenomena. As a result of the large kinetic energies observed combined with no a lack of an obvious energy source, the team theorizes that the driving sources may be black holes rapidly plunging into molecular clouds. 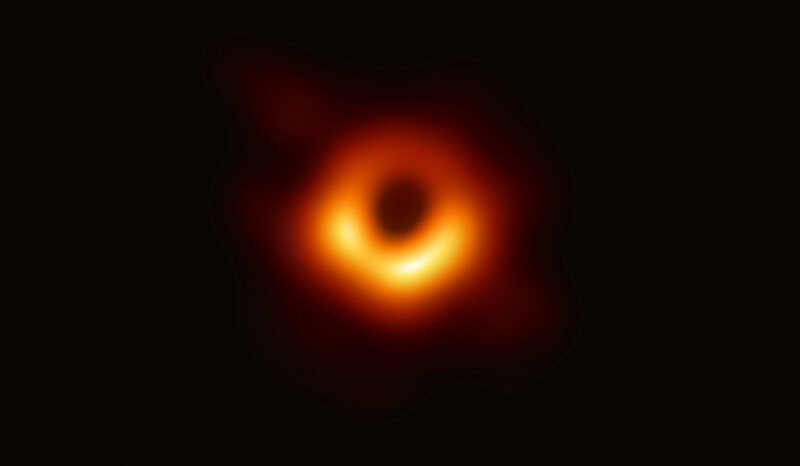 The Galactic nucleus Sgr A* is located at a distance of approximately 26,000 light years from the Earth, and recognized as a supermassive black hole with 4 million solar masses. The origin of the supermassive black hole remains unresolved. In contrast, a stellar mass black hole, which has a mass ranging from about three to several tens of solar masses, is known to be formed by the gravitational collapse of a massive star heavier than 30 solar masses. It is theoretically predicted that several hundred million stellar mass black holes lurk in the Milky Way. However, the number of black hole candidates currently detected in the Milky Way is only 60. In general, gas and dust drawn by the gravitational force of a black hole constitute an accretion disk around it. After the materials are sufficiently accreted and the accretion disk gets hotter and emits intense electromagnetic waves. Typically stellar mass black holes in the Milky Way have been found by detection of X-ray radiation from their accretion disks. In order for an accretion disk to be continuously shining, a fueling source, i.e. a companion star, must be in the close vicinity of a black hole. However, such black holes (those with close companions) are very rare. Most of back holes are likely to be isolated and inactive. Thus, countless “stray black holes” should be floating in the Milky Way. 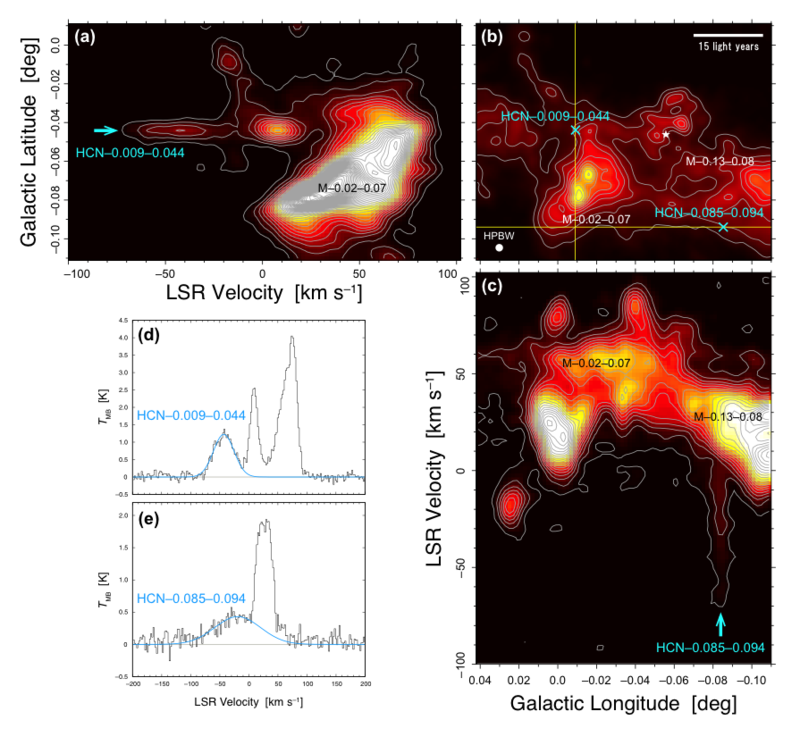 The research team conducted spectral line observations of the Galactic central region within 30 light years of the Galactic nucleus Sgr A* to investigate kinematics and physical properties of molecular gas surrounding the nucleus, using the JCMT. In the observations, the team discovered two unusual molecular clouds (HCN–0.009–0.044 and HCN–0.085–0.094) with diameters of about 3 light years and extremely broad velocity widths wider than 40 km/s (See Figure b below). Each of these unusual clouds appears to stem from a larger cloud. Their motions seem to be different from those of well-known molecular clouds around the nucleus (See Figure a, and c below). These motions imply enormous kinematic energies (>1047 erg). Such enormous kinetic energy may be produced by an interaction with a supernova explosion or a bipolar outflow form a bright massive protostar. However, no evidence of a supernova or a bright protostar was found toward these peculiar clouds. The origin is probably “something” other than well-known astrophysical phenomena; inactive stellar mass Black Holes. The data used to make this discovery (a) Position-velocity diagram along the yellow vertical line in the panel (b). 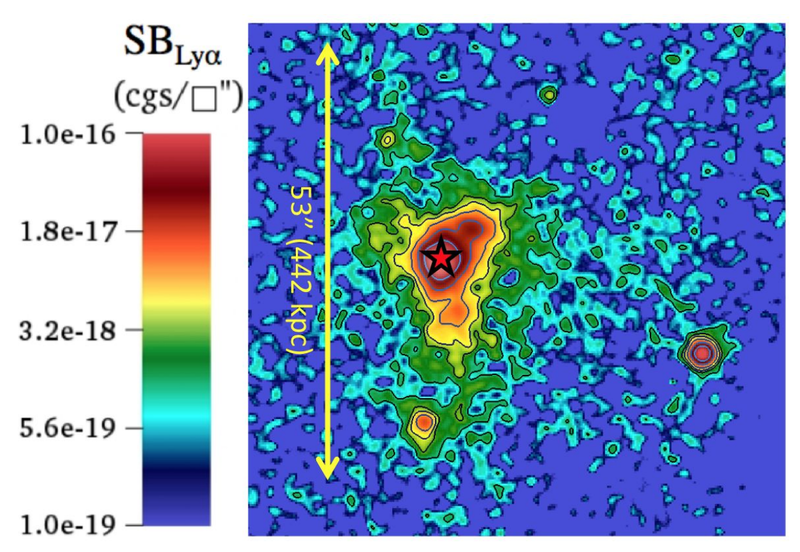 (b) Integral intensity map of the Galactic central region around Sgr A* (shown by a white star) in the hydrogen cyanide (HCN) 354.6 GHz spectral line. The light-blue cross marks indicate the locations of the discovered peculiar compact clouds (HCN–0.009–0.044 and HCN–0.085–0.094). (c) Position-velocity diagram along the yellow horizontal line in the panel (b). (d, e) The spectral lines detected toward the peculiar clouds. A massive compact object with a mass larger than about 10 time the mass of our Sun plunges with a high velocity of about 100 km/s into a molecular cloud. A compact object with a mass similar to that of the Sun plunges with a ultra high velocity of about 1000 km/s into a molecular cloud. In the case 1), the candidate for the plunging object is a massive star or black hole. In the case 2), the candidate is a hypervelocity star which moves so fast that it can escape from the gravity of the Galaxy. However, no hypervelocity star has been found in the Galactic center and the number is theoretically predicted to be much less than that of black holes. Therefore, the driving sources of the two discovered clouds are likely to be massive stars or black holes. In addition, no bright massive stars have been found toward these clouds. Thus, a “stray black hole” floating around the supermassive black hole is the most plausible candidate for each of the driving sources of the two clouds. This work is very meaningful since the possibility that a number of “stray black holes” are floating around a supermassive black hole at the Galactic center was indicated by the observational study for the first time. The team has already discovered the peculiar molecular cloud in the Galactic disk (Bullet) that may also be driven by a high-velocity plunge of a stray black hole (Yamada et al. 2017, https://www.nao.ac.jp/en/news/science/2017/20170202-aste.html). These studies which are based on spectral line observations of molecular gas suggest a new method of potentially discovering inactive isolated black holes that are undetected by traditional method such as X-ray observations. The number of black hole candidates is expected to dramatically increase by applying research methods similar to this work. (Oka et al. 2017, https://www.nao.ac.jp/en/news/science/2016/20160115-nro.html). This intermediate mass black hole and stray black holes discovered in this work possibly contribute to growth of the supermassive black hole in future. These observation results were published as Takekawa et al. “Discovery of Two Small High-velocity Compact Clouds in the Central 10 pc of Our Galaxy” in the Astrophysical Journal Letters in July 2017. The team behind this work are Shunya Takekawa, a Ph.D. student at Keio University, Japan, and Tomoharu Oka, a professor at Keio University. This study was supported by a Grant-in-Aid for Research Fellow from the Japan Society for the Promotion of Science (15J04405). 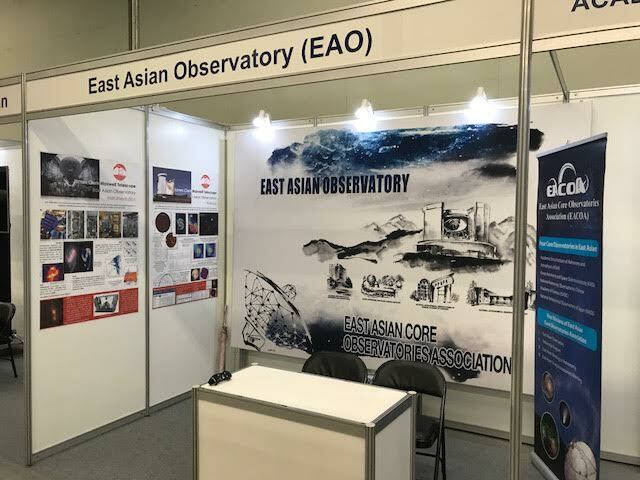 Astronomers from the East Asian Observatory/JCMT are in Taipei, Taiwan this week for the Asia Pacific Meeting of the International Astronomical Union (APRIM). If you are there please pop by our booth and say hello! 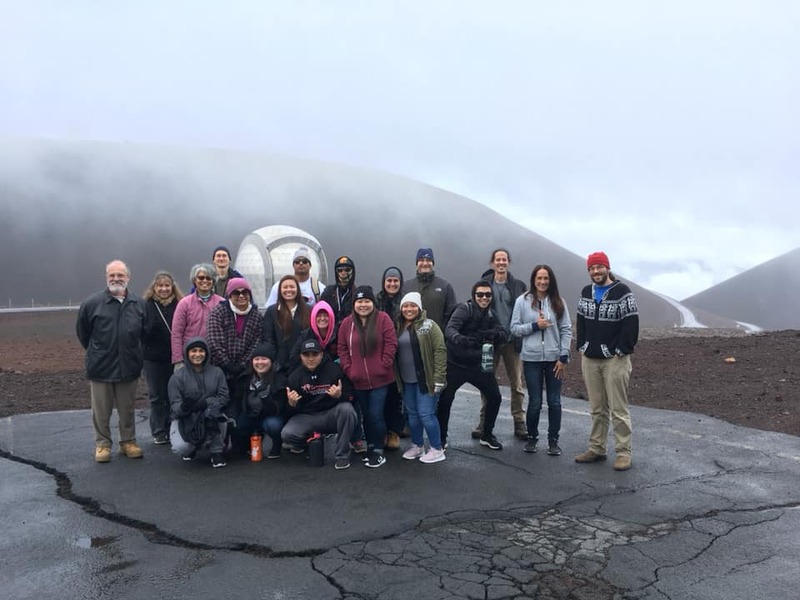 For two days at the end of June EAO/JCMT hosted its first “Maunakea Wonders Teacher Workshop” primarily aimed at newly qualified teachers here on the island of Hawai’i. 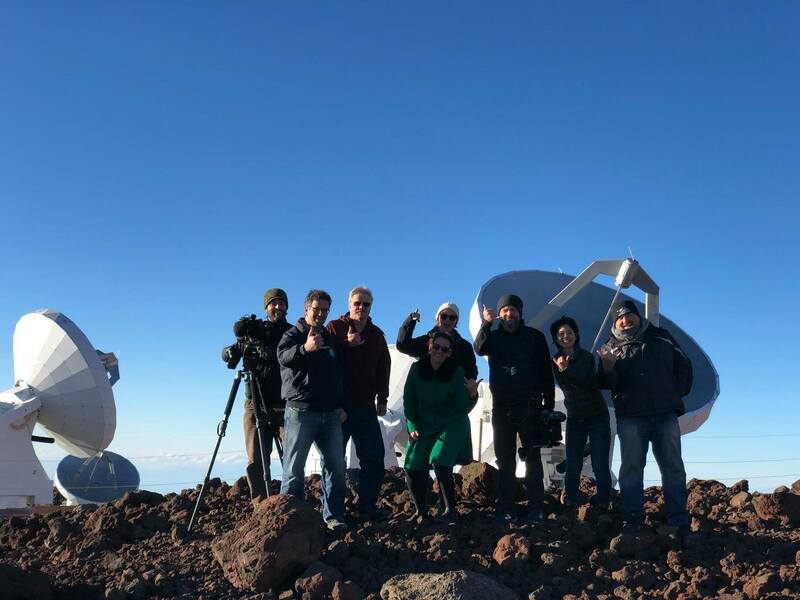 One day was spent learning about the cultural, environmental and astronomical role Maunakea plays combined with a trip to visit the CFHT (Canada France Hawai’i Telescope), and the JCMT. 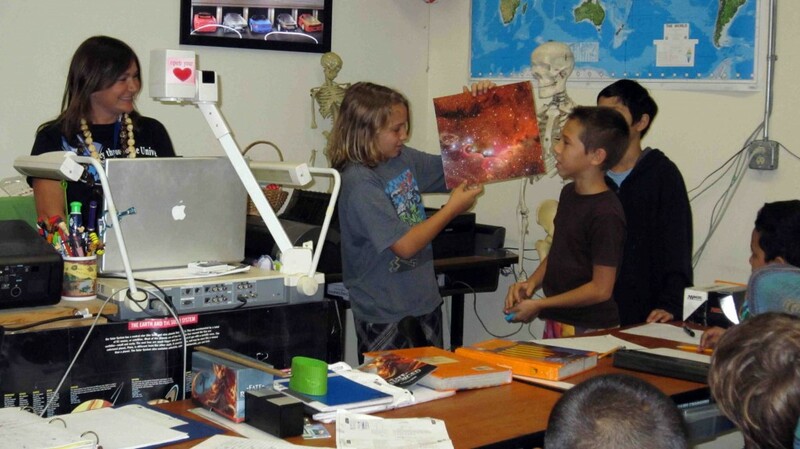 The second day was spent in the classroom discovering what Hawaii more about astronomy on the big island and the resources available to the community, teachers and students in Hawaii. 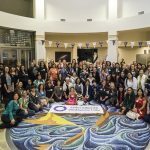 The workshop was kindly supported by MKAOC/CFHT and the University of Hawai’i Hilo’s School of Education. 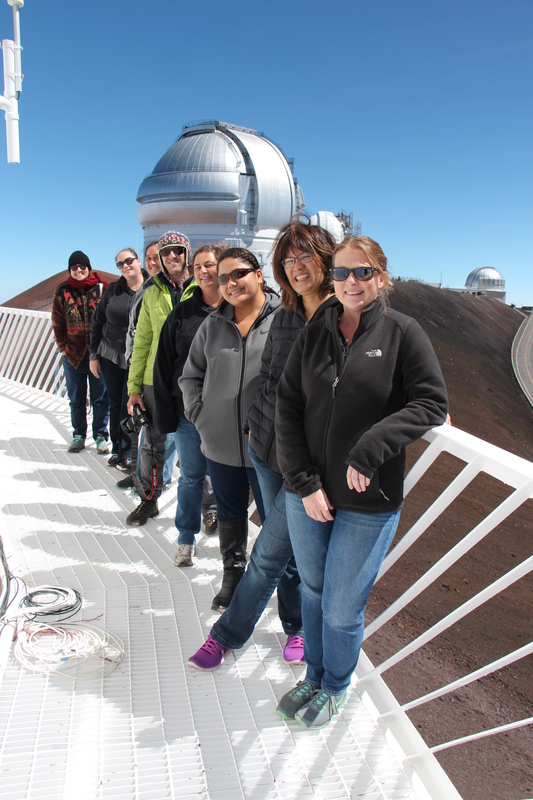 First day of the Maunakea Wonders Teacher workshop included a trip to the Canada France Hawaii Telescope and then to JCMT. 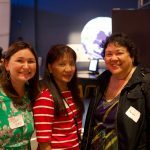 Discovering Teaching opportunities in Hawaii – with Gemini’s Starlab. 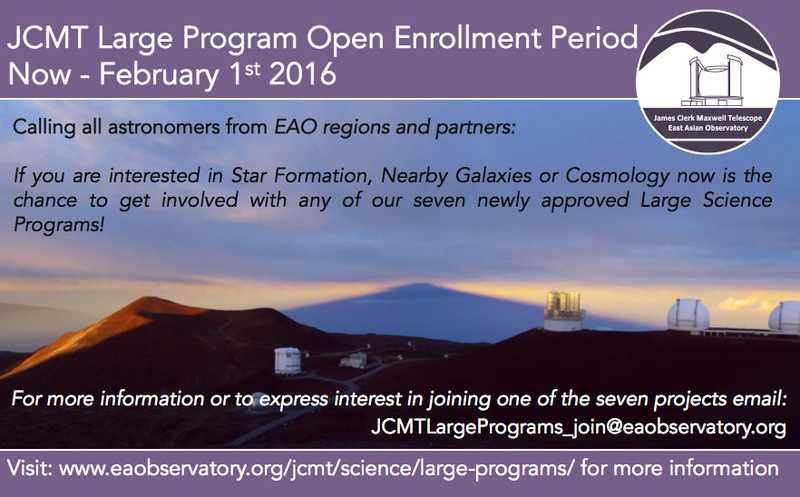 Please note only astronomers from EAO regions and partners will be permitted to join. This open enrollment period will end at 8am HST on August 1st 2017. 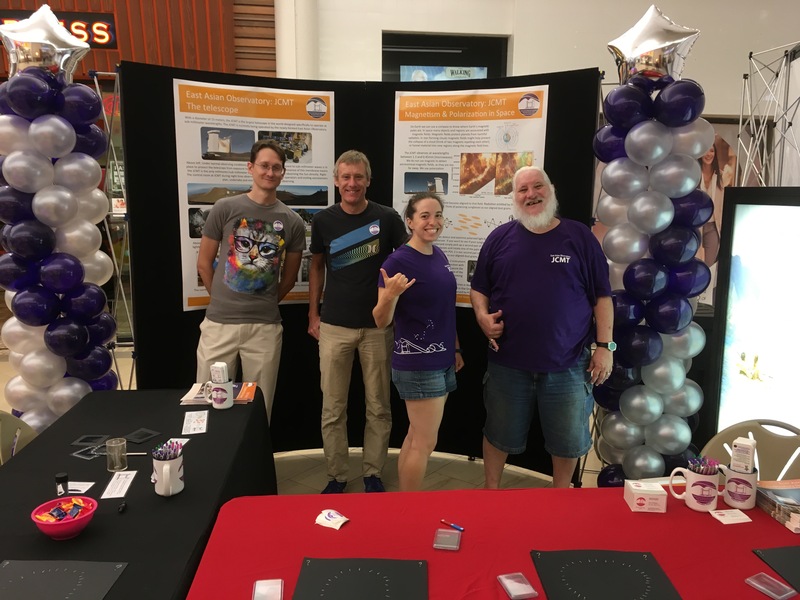 EAO/JCMT staff once again volunteered their time to spend the day connecting with the community at the annual Hilo AstroDay. This year we explored the concept of magnetism and polarization in space. 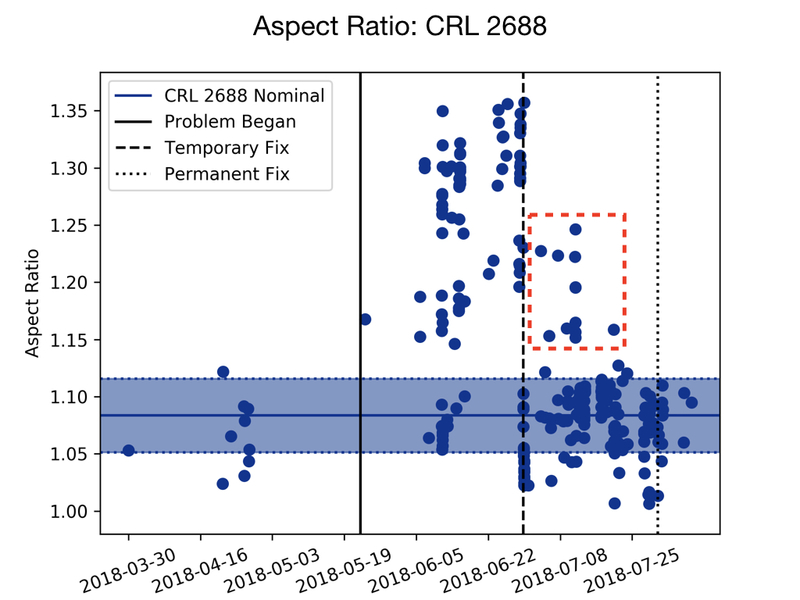 SCUBA-2 has been back on the sky for the past month producing excellent data, following both planned engineering down time to work on the instrument cryogenics and unplanned – to fix a vacuum leak. The end of 2016 was a busy time for the EAO ETIS (Engineering, Technical Information Systems) staff. From the middle of the 2016 we were aware of a change in performance of one of the (two) pulse tube coolers (PTC) that cools the SCUBA-2 inner radiation shields and internal mirrors to below 4K. We were able to continue to use SCUBA-2 without any impact on the quality of the data, while we planned the major task of taking the 3 tonne instrument off the antenna and replacing both of the instrument PTC cold heads with new remote motor models. The dilution fridge mixture was removed and the warm-up started on October 5th. SCUBA-2 was back on the sky with new PTCs and was operational by November 18th, 1 week ahead of schedule. However, during the subsequent cooldown, the cryostat vacuum was found not to be as good as expected. Later in December, when we temporarily warmed-up (to 4K) to replace a small pump in the dilution refrigerator (DR) gas handling system – a regular procedure, the poor vacuum became a serious issue. Additional problems with pumps in the GHS and too high a pressure in the DR still prevented cooling below 1K. This is well above the operating temperature of the TES detectors. The only course was to warm the instrument to ambient temperature and to then carry out extensive leak checking of the cryostat. A leak was found that we could fix. However, on detailed inspection, we discovered that the O-ring between the feedthrough and the top plate of the DR insert was cracked and would fail soon if we did not replace it. Two weeks of skill and persistence was required to replace this O-ring to enable SCUBA-2 to be yet-again pumped, leak checked and cooled prior to the end of January. With the vacuum leak fixed, the cause of the second issue with the GHS that prevented cooling below 1K became apparent. This issue was caused by a particle filter on the input of the pump. After removing the offending filter SCUBA-2 was operational by February 5th. The loss of an additional 6 weeks of observing with SCUBA-2 impacted our users. 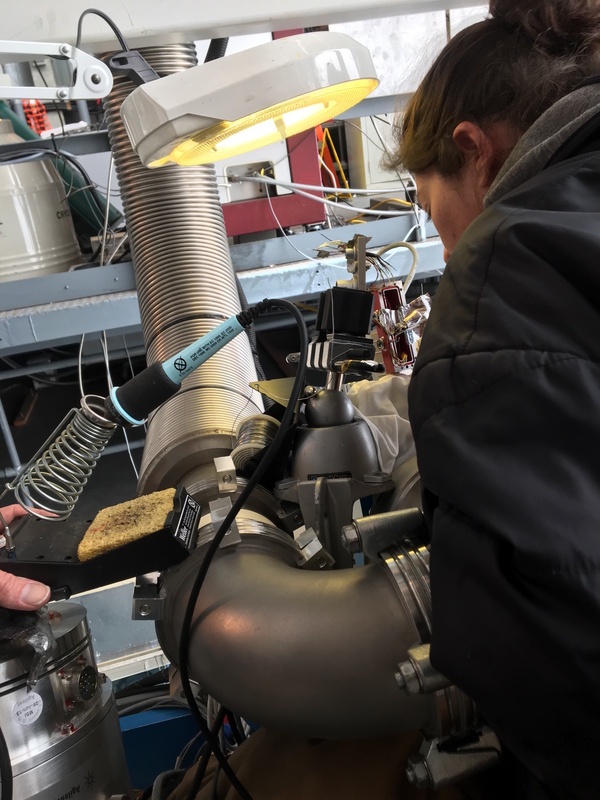 However, by catching the failing O-ring before a total loss of vacuum, we avoided the potential for more serious consequences to the instrument and a bigger disruption of the observing schedule. An extended period of good stable weather in recent weeks has allowed some of the affected programs to makeup for the missed nights. In addition to the cryogenic work, new improved thermal blocking filters have been installed between the instrument window and the band defining filters for the detector arrays. We are now investigating the change in optical power on the detector arrays, to see if this has modified the stray light environment within the 4K box and improved SCUBA-2’s performance. Jamie Cookson works on the repair of SCUBA-2. Over the past two weekends the JCMT has been open and observing during the day. These daytime observations are needed to observe the middle atmosphere (altitude 70-110 km) of Venus. The aim is to better understand atmospheric physics and chemistry. 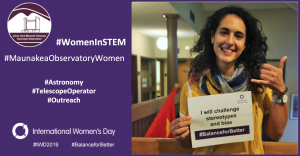 The way to advance understanding of fundamental atmospheric physics and chemistry in general is to study the atmospheres of individual planets – specifically in this case Venus! 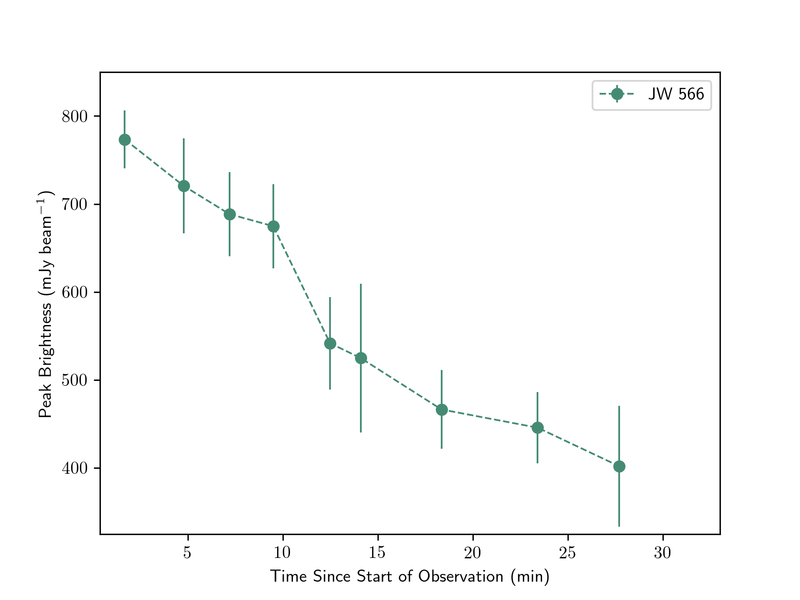 The JCMT is used for this study because sub-millimeter spectroscopy is uniquely powerful for investigations of this altitude range on Venus. 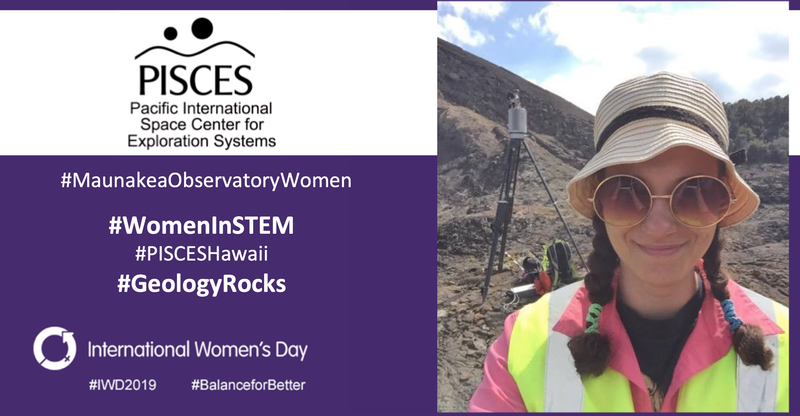 JCMT’s location on Maunakea, its ability to safely point arbitrarily close to the sun, and its observation flexibility (capability to modify observing strategies in as little as 5 minutes, during the observations) make it uniquely well-suited to Venus research. Here is a video of the sky above the EAO office in Hilo – can you spot Venus? If you want to see what the weather is like on Maunakea click here. 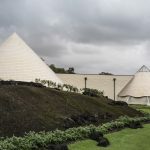 For a link to the EAO Hilo office weather click here. 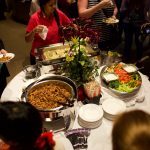 This March EAO/JCMT staff celebrated our second birthday. We wish all our EAO friends a very productive and happy 2017! – photo courtesy of Michael Hoenig. Congratulations to Harriet Parsons who was nominated for 2016 Employee of the Year award. 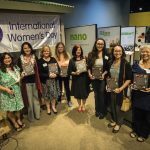 All nominees were awarded at a lunch on March 6th 2017. To see the video for all the RCUH nominees click here. We are currently recruiting for an Electronic Engineer to join the EAO/JCMT Engineering Group. 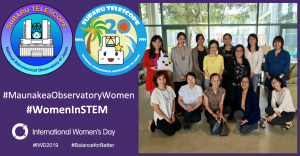 This group ensures that the telescopes and associated instruments are at a high level of operational readiness at all times. They apply technical knowledge in support of the testing, modification, maintenance, repair, and upgrading of EAO mechanical, electronic and electrical systems. For more information visit the EAO Jobs homepage. 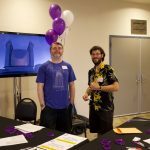 JCMT 2017 Users Meeting – see you again next year! The 2017 JCMT Users meeting was held in Nanjing, China. The two day meeting was held on Monday, 13th and Tuesday 14th of February. An additional 1 half-day data reduction workshop was held immediately after the meeting on Wednesday 15th of February. The meeting was well attended and all talks are now available online here. 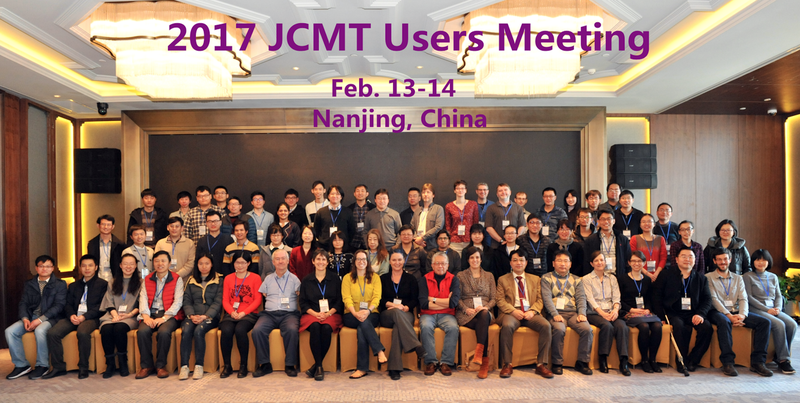 We hope you have a good productive 2017 and hope to see you at our JCMT 2018 Users meeting in South Korea next January. The East Asian Observatory is happy to invite PI observing proposals for semester 17B at JCMT (for details see here). Semester 17B runs from 01 August 2017 to 31 January 2018. 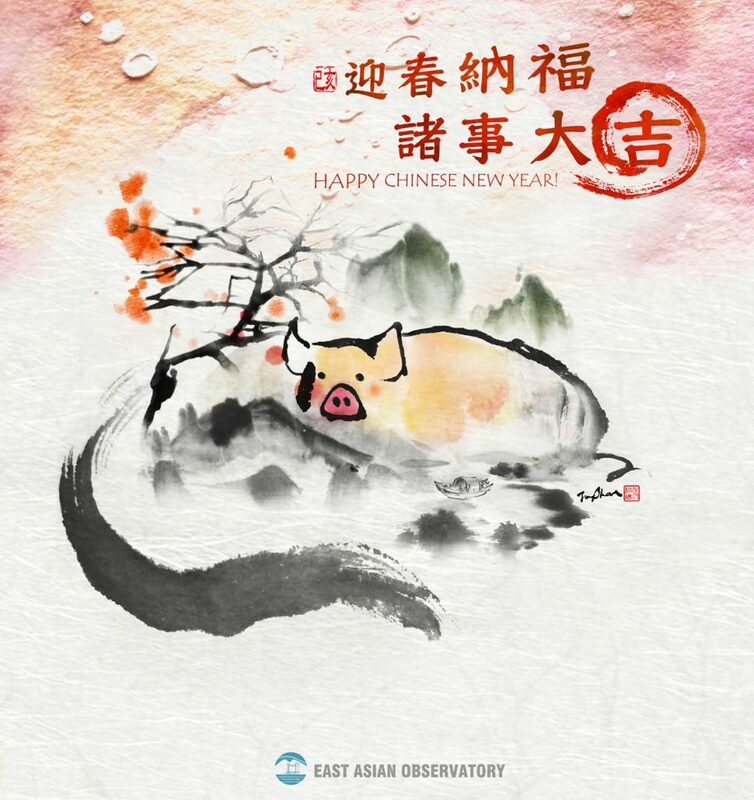 In addition the East Asian Observatory is happy to accept proposals for Large Programs – running from 01 August 2017 to 31 January 2019. More details about the Large Programs (II) call can be found here. The 17B Call and Large Program (II) call for Proposals closes on the 15th of March 2017. 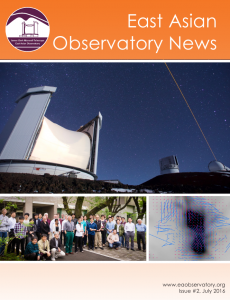 The 17B semester Call at the Subaru Telescope is now open, click here for more details. 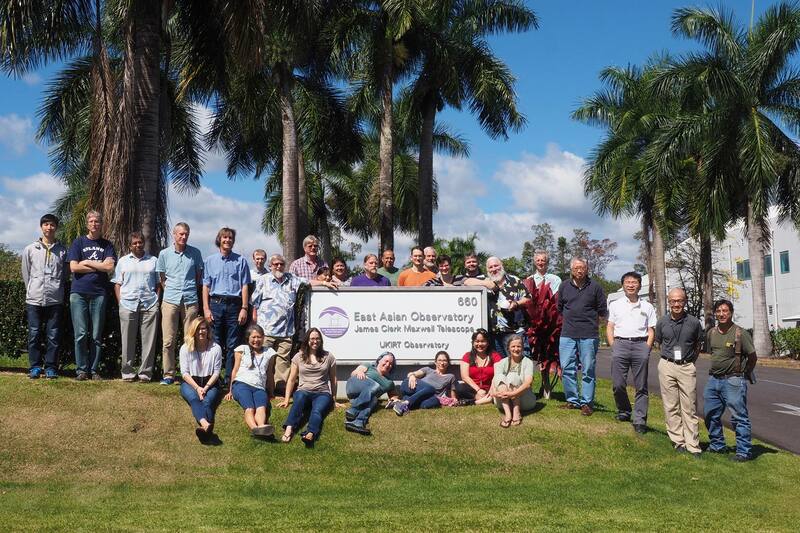 The EAO/JCMT is currently seeking an astronomer to join its team of support scientists. 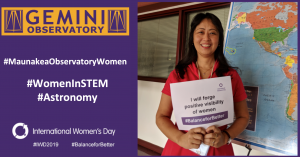 Duties include: Assists visiting astronomers in obtaining high-quality observational data; provides technical, scientific, and logistical support to astronomers before, during, and after their observing runs, and assists with their data analysis. Performs general and specific support of the telescope operations and/or instruments and their development. Undertakes a program of astronomical research, which may or may not be related to using the James Clerk Maxwell Telescope (JCMT). 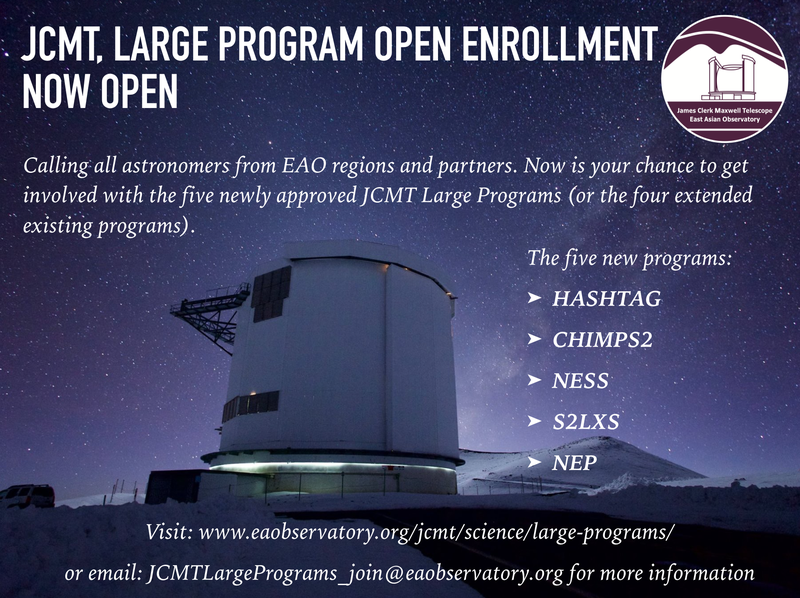 The East Asian Observatory is pleased to provide an early announcement of the second Call for JCMT Large Programs. This information is being provided ahead of the opening of the Call in order for current and new teams to pursue discussion and planning. Submissions will be accepted from February 15th up until the March 15th deadline. This will coincide with the 17B PI Call. 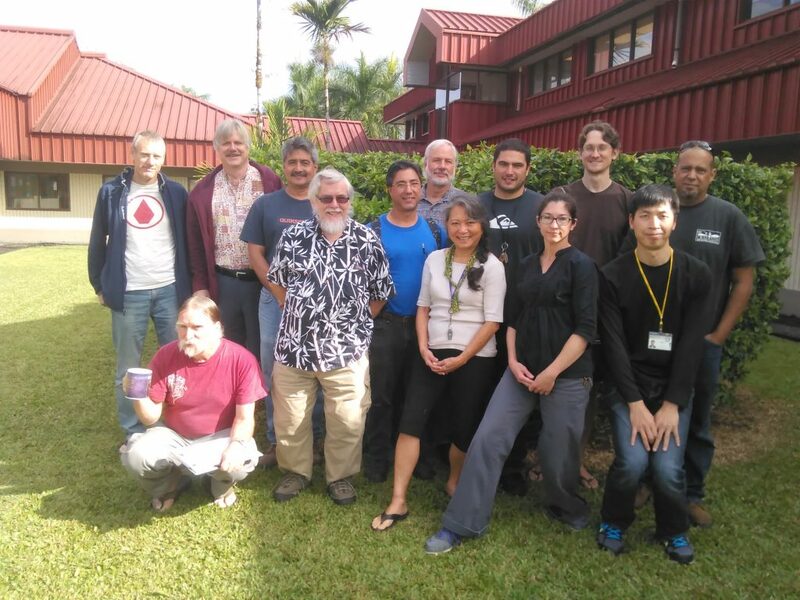 At the start of October the JCMT held a Data Reduction workshop for JCMT astronomers. The workshop was held at the Shanghai Astronomical Observatory in China. 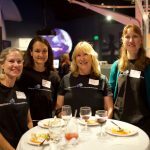 Over 20 astronomers attended with a variety of backgrounds. The material presented at the workshop can be found here. Information on past workshops can be found here. If you are interested in having JCMT staff visit your institution for such an event please contact helpdesk@eaobservatory.org. Participants at the JCMT reduction workshop, China, October 2016. For the second successive summer, we have experienced unusually poor weather at the start of the B-semester, and we are facing a period of 7 weeks without SCUBA-2 in October and November, as it undergoes important maintenance. The combination of these events has severely impacted our supply of approved band-3/4 heterodyne programs. We therefore invite new proposals to observe targets with 20h < RA < 04h with HARP and/or RxA, for immediate assessment, approval and execution. See here for details; where the ‘Semester’ in question is called ’16X’. This Call for Proposals closes on the 11th of October 2016. We welcome submissions now. You are invited to attend the second EAO JCMT Users Meeting. This 2017 JCMT Users meeting will be held in Nanjing, China. The two day meeting will be held on Monday, 13th and Tuesday 14th of February. An additional 1 half-day data reduction workshop will be held immediately after the meeting on Wednesday 15th of February. To register for the 2017 Users Meeting please use the online registration form. 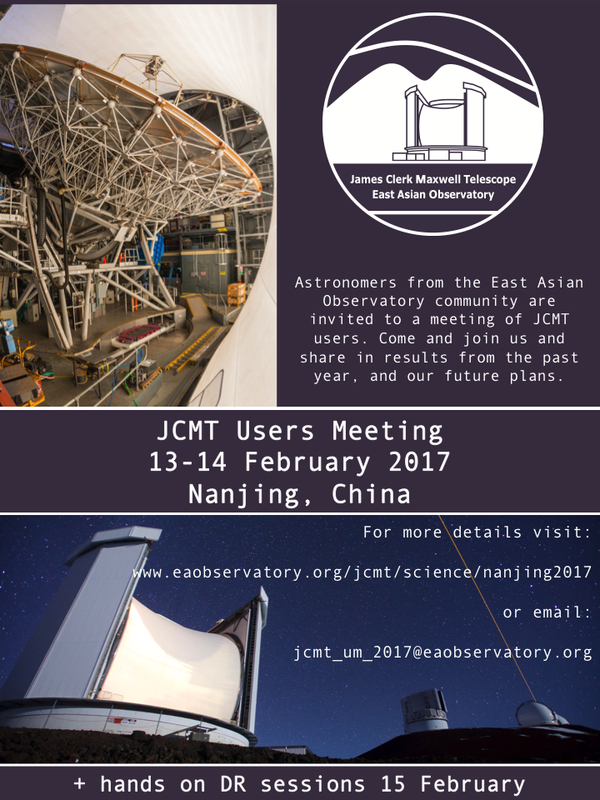 Note: If you cannot access the registration form (which is a Google document), then please use this text form and email to jcmt_um_2017 “at” eaobservatory.org. Note: All participants coming from outside of mainland China will likely require a visa. Therefore to request a letter of invitation to attend this meeting please email: jcmt_um_2017 “at” eaobservatory.org This process can be lengthy. You are encouraged to request this invitation letter and begin the visa application process as soon as possible. 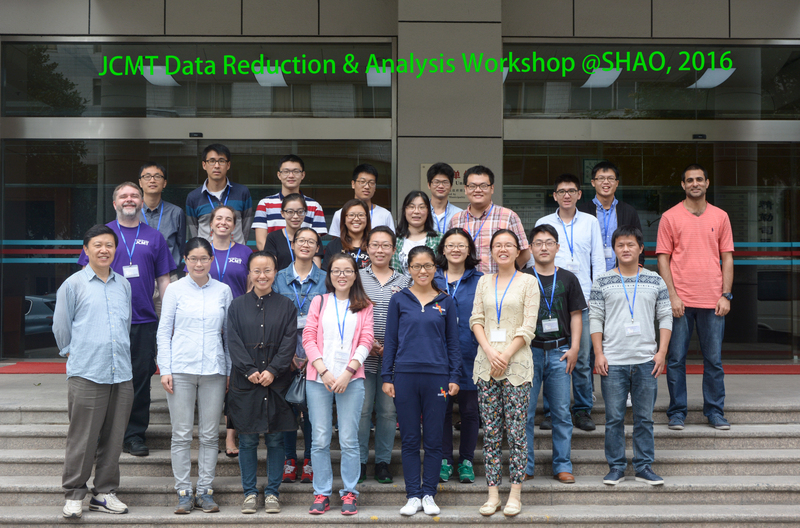 The JCMT would like to announce that the Shanghai Astronomical Observatory will hold 1-day workshop on JCMT data reductions and analysis on Oct. 16 at SHAO in Shanghai. JCMT staff, Dr. Harriet Parsons and Dr. Mark Rawlings, will give these tutorials. The agenda can be found below. 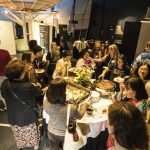 This workshop is scheduled before JINGLE team meeting in Shanghai (Oct. 17-18) and MALATANG team meeting in Nanjing (Oct. 19-21) as a united conference. We aim to open this tutorial to all interested researchers and students, and high priority will be given to members of JINGLE, MALATANG and other JCMT large programs due to space limitation. If you are interested to attend, please contact Ting Xiao (xiaoting@shao.ac.cn) as soon as possible to help us get a rough head account. If you are interested in any additional topics listed above, please inform us in the email. SCUBA-2 was recently returned to service after a 5-week-long absence due to a partial cryogen blockage. It has been returned to full service, despite requiring alternative operating conditions because of a problem diagnosed with one of the Pulse Tube Coolers. This issue has left the instrument filters at temperatures that are fractionally warmer than normal. SCUBA-2 operation will be maintained until October 5, when it will be removed from the telescope to replace the PTCs and also install new optical filters which we expect to improve the instrument performance. SCUBA-2 return to service is expected on or before November 24. We apologize for the inconvenience and will keep you updated as to our progress. The Planck satellite has discovered more than ten thousand Galactic cold clumps, the so-called “Planck Galactic Cold Clumps” (PGCCs). The PGCC catalog, covering the whole sky, hence probes wildly different environments, and represents a real goldmine for investigations of the early phases of star formation. 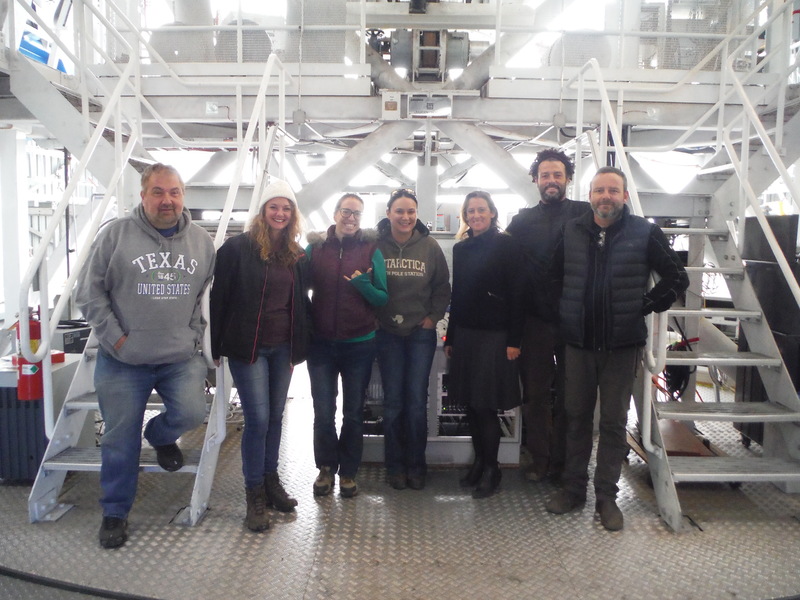 After the successful start of the pioneer survey with the PMO 14-m telescope, we are conducting a joint survey (“SAMPLING-TOP- SCOPE”) towards 1000-2000 PGCCs with the SMT 10-m, TRAO 14-m, and JCMT 15-m telescopes. “SAMPLING” (SMT “All-sky” Mapping of PLanck Interstellar Nebulae in the Galaxy) is an ESO public survey inJ=2-1 12CO/13CO emission using the SMT 10-m telescope. “TOP” (TRAO Observations of Planck cold clumps) aims at an unbiased J=1-0 12CO/13CO survey of 2000 Planck Galactic Cold Clumps with the Taeduk Radio Astronomy Observatory 14-meter telescope. 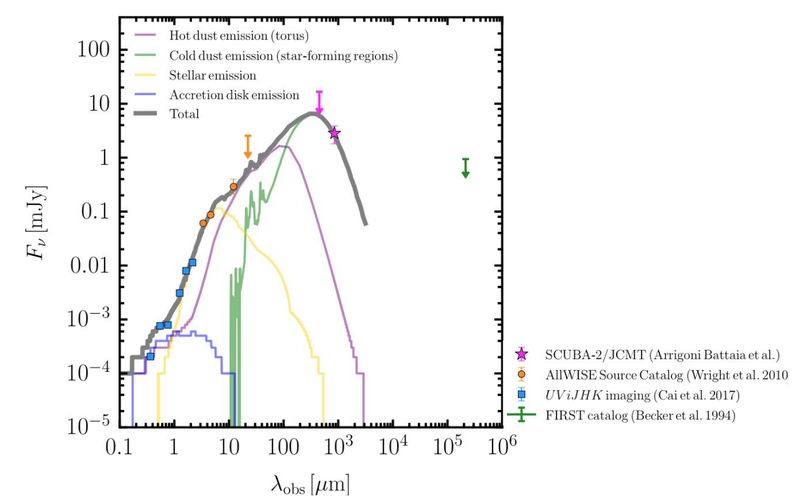 “SCOPE” (SCUBA-2 Continuum Observations of Pre-protostellar Evolution) is a legacy survey using SCUBA-2 at the James Clerk Maxwell Telescope (JCMT) of the East Asia Observatory (EAO) to survey 1000 Planck galactic cold clumps at 850 micron. We are also actively developing follow-up observations towards the SCUBA-2 cores detected in “SCOPE” with other ground-based telescopes (e.g. KVN 21-m, NRO 45-m, Effelsberg 100-m, Arecibo 300-m, SMA, and ALMA). Through these observations, we will study how dense cores form and how star formation varies as a function of environment, the universality of filaments in the cold ISM and their roles in generating dense cores, the existence of a density threshold for dense core formation, how dust properties change in different environments, and how dust properties affect the chemical evolution of dense cores. For previous JCMT Newsletters and articles visit out Newsletter page. The JINGLE Team meeting and JCMT Data Reduction & Analysis Workshop will be held on Oct. 16-18 in Shanghai at the Shanghai Astronomical Observatory, China. JINGLE (The JCMT dust and gas In Nearby Galaxies Legacy Exploration) began in Dec. 2015, and the overall program completion is about 1/4. Team members are encouraged to join the team meeting on Oct. 17-18 to discuss the survey status and plan, data reduction and evaluation, data analysis, and most importantly the scientific projects based on survey data. 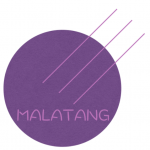 The JINGLE meeting and MALATANG meeting are scheduled in one week for a united conference focusing on two main themes: 1) cold gas and dust in large sample of galaxies and 2) dense gas and gas/dust in the nearest 20+ brightest infrared galaxies. Before the JINGLE team meeting, we will have 1-day tutorial on JCMT data reductions and analysis provided by JCMT staff. We will open this tutorial to all interested researchers and students. But due to space limitation, high priority will be given to JINGLE members and members of JCMT large programs . If you need an invitation letter for VISA application, please contact the LOC as soon as possible! The coordinators for the MALATANG Large Program invite you to attend thier first face-to-face team meeting on Oct. 19-21 in Nanjing. Team members are highly encouraged to join the meeting, to discuss survey status, data reduction and evaluation, data analysis, future observations, and all the potential scientific projects. Note that prior to the MALATANG meeting, the JINGLE meeting will be held on Oct 16-18 in Shanghai, including a JCMT tutorial on Oct 16. Further details regarding the JINGLE meeting will follow soon. MALATANG and JINGLE share some common/related subjects and overlap members, so you may consider attending both! The 2016 JCMT Users Meeting, held in Japan was a great success. If you couldn’t make it in person you can access all the slides from the talks here. The Integration Time Calculator in Hedwig has also been updated. When performing a SCUBA-2 calculation, you can now select the POL-2 scan pattern POL-2 Daisy, to get a POL-2 time or noise estimate. Please do remember, the 16B call for proposal closes in only 15 days! We welcoming Jessica Dempsey to the role of Deputy Director of the JCMT. 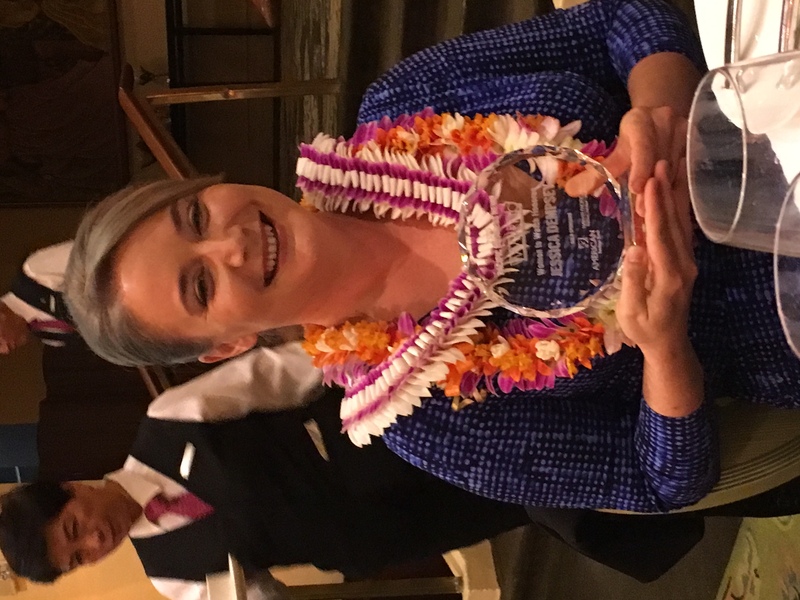 In addition to this we are proud to announce she has been also just been recognized with a Women Who Mean Business award for “Women to Watch”. 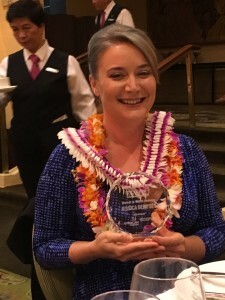 Jessica Dempsey receiving the award for “Women to Watch” March 2016. 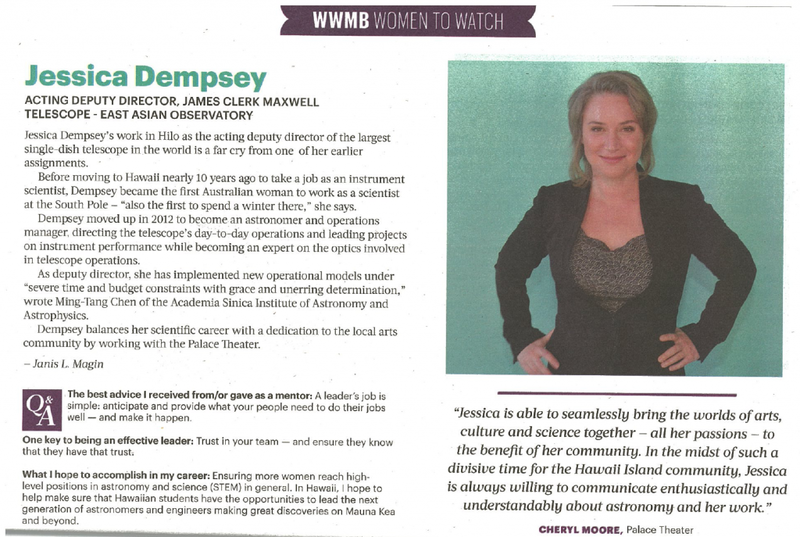 Jessica Dempsey winner of “Women to Watch” 2016. The East Asian Observatory is happy to invite PI observing proposals for semester 16B at JCMT (for details see here). The 16B Call for Proposals closes on the 15th of March 2016. The JCMT is pleased to announce that its JCMT Legacy Release 1 (SCUBA-2 850µm) data set is now publicly available. This project makes available to the community uniformly reduced observations of most public SCUBA-2 850µm observations taken before 2013-08-01, as well as coadds and emission catalogs. Please see our web page on the JCMT-LR1 for more details. Public 850µm SCUBA-2 observations taken between 2011-02-01 and 2013-08-01. Gridded onto HEALPix tiles using the HPX projection. Coadds of all the reduced non-pointing observations which passed Quality Assurance coadded onto a single tile. Catalogues of detected (>5σ) regions of contiguous emission (extents) towards each tile. Catalogues of local peaks within the extents of each tile. Over 2000 hours of observing time included. Search CADC with proposal ID=’JCMT-LR1′ to view the coadds and catalogues. The East Asian Observatory is happy to invite PI observing proposals for semester 16A at JCMT (for details see here). The 16A Call for Proposals closes on the 22nd of September, 2015. The JCMT announces the opening of the Call for Survey Proposals. The deadline for submission of a survey proposal is July 31st, 2015. All details and submission requirements can be found at the link above. 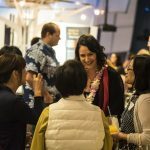 To all JCMT users a reminder that the Call for Proposals for semester 15B closes Friday, May 15th, 15:00 Hawaiian Standard Time. For more information click here. 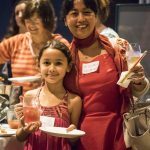 AstroDay is one of the most engaging outreach events on the Big Island and fun for the whole family! 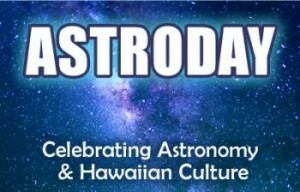 Come on down to the Prince Kuhio Plaza in Hilo, Hawaii on Saturday, May 2nd from 10am – 4pm for a celebration of Astronomy and Hawaiian Culture. The mall will be packed with exciting exhibits and interactive displays, live music and performances on a main stage, plus tons of free handouts and chances to win cool prizes. We hope to see you there! Semester 15B runs from 01 August 2015 to 31 January 2016. Observing proposals are now invited. For further details see here. 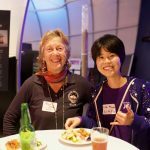 The Journey Through the Universe program is always an enormous success in Hawaii, and this year was no different. 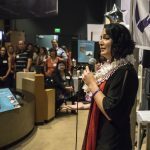 Over the past 11 years, scientists, astronomers, and engineers have engaged over 50,000 students while visiting over 3,000 classrooms on the Big Island during the annual “Journey” week. This March, several EAO staff presented exciting information and activities to over 100 students in grades 5-8 in the Hilo-Waikea Complex. 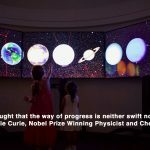 For more information on Journey Through the Universe visit http://www.gemini.edu/journey. 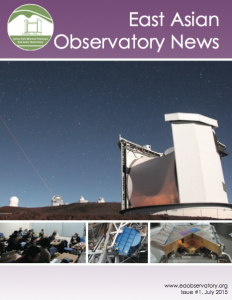 It is with great enthusiasm that the East Asian Observatory (EAO) announces its first day of operations of the James Clerk Maxwell Telescope (JCMT). The JCMT is the largest astronomical telescope in the world designed to operate in the sub-millimetre wavelength region of the spectrum. EAO is now in charge of JCMT operations in partnership with the UK and Canadian research communities. EAO would like to thank the people of Hawaii for allowing our astronomers to work on top of one of the most beautiful places on earth. The Science and Technology Facilities Council of the UK have also issued their own statement about this occasion. The statement can be found here. 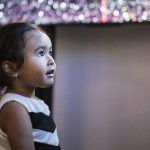 Journey Through the Universe is February 27th – March 6th! 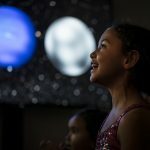 A nationally recognized week long event in which astronomers visit local classrooms around the island while sharing their passion for physics and astronomy. 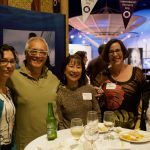 Several EAO staff members will be representing the JCMT and hoping to inspire a future generation of scientists! 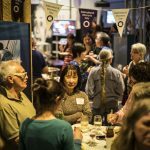 Visit the Journey Through the Universe website for a complete listing of upcoming local events associated with Journey.